본 발명은 폴리(아미드-이미드), 폴리(아미드-아미드산), 폴리 아미드산, 폴리(에스테르이미드)와 폴리(에스테르아미드산), 폴리이미드 조성물, 특히 열가소성을 갖는, 열에 안정한 방향족 폴리이미드 조성물 및 이들의 제조방법에 관한 것이다. The present invention is a poly (amide-imide), poly (amide-amide acid), polyamide acid, poly (imide) and poly (ester amide acid), polyimide compositions, particularly having a thermoplastic, heat stable aromatic polyimide composition and a process for their preparation. 폴리이미드 또는 폴리이미드-함유 조성물의 성질을 개량하기 위하여 이들의 분자구조에 여러 가지 방향족 화합물을 결합시켜서 개량된 가공성 및 열 안정성을 갖도록 많은 시도를 해왔다. Polyimide or polyimide-by combining a number of aromatic compounds to their molecular structure in order to improve the properties of the contained composition has a number of attempts have an improved processability and heat stability. 그러나 이들 중합체는 통상 열융해 공정에 의한 제조 또는 가공에서 열 안정성이 부족하고 양호한 접착성 또는 내용제성과 같은 기타 유용한 특성이 결핍되기 때문에 만족스럽지 못했던 것이다. However, these polymers will usually did not satisfactory because they lack thermal stability in the manufacturing process or by heat melting process, and a good adhesion or other useful properties, such as the performance deficiency. 고온에서 안정성을 갖는 폴리이미드의 제조는 공지되어 있으며, 열 안정성 폴리이미드는 이 무수물로서 여러 가지 방향족 테트라카르복실산 또는 이의 유도체를 방향족 디일급아민과 반응시켜서 쌍극성 비양성자성 유기 용매애 용해할 수 있는 폴리이미드산을 형성시켜서, 제조한다. Preparation of polyimide having a stability at a high temperature are known, thermally stable polyester by already as the anhydride lifting react with various aromatic tetracarboxylic acids or derivatives thereof, aromatic dicarboxylic primary amine dipolar aprotic organic solvent trying to dissolve It can be prepared by forming a polyimide acid that. 폴리아미드-산을 열처리 또는 화학 방법에 의해서 환화시켜셔 폴리이미드를 성성시킨다. Polyamide-acid was cyclized by a heat treatment or a chemical method causes a slow-shutter polyimide. 그러나, 이러한 폴리이미드는 통상 취급이 어렵고, 대부분의 용매에서 불용융 및 불용해성 이기 때문에, 불가능한 것은 아니지만 성형하기가 어렵다. However, it is difficult to this polyimide normal handling, since the non-melting and insoluble in most solvents, it is not impossible, it is difficult to form. 그러나, 폴리아미드-산 프리폴리머 용액을 제조한 다음 폴리이미드로 열처리 경화시킬 때 필요한 온도 피복될 기질에 대하여 너무 높고 다소 물의 양은 용제의 증발과 더불어 조절할 수 없이 방출된다. However, the polyamide-acid is released to produce the prepolymer solution without and then adjusted with a too high evaporation of some amount of water solvent relative to the substrate to be coated necessary temperature when the heat treatment hardening of polyimide. 이는 이러한 재료들의 용도에 대한 다른 제한을 상승시킨다. This raises other limitations on the use of these materials. 최근, 각종 방향족 화합물과 복소환식 화합물을 연구하여 쉽게 처리하고 제조할 수 있는 열 안정성 폴리이미드를 얻도록 시도해 왔다. In recent years, easy handling and study of various aromatic and heterocyclic compounds, and have tried to obtain a thermally stable polyimides that can be produced. 예를들면, 루보위츠의 미국특허 제3,699,075호와 제3,812,159호, 헤드 등의 미국특허 제 3,847,867호, 헤드의 미국특허 재 3,879,428호에, 방향족 디에테르 폴리카르복실산과 이의 무수물을 방향족 디이민과 반응시켜, 유기 용제에 용해할 수 있고 용융하는 고분자량의 열 안정성 폴리이미드를 제조하는 것이 소개되어 있다. For example, rubo wicheu U.S. Patent 3,699,075 No. and No. 3,812,159 No. of the head, such as the U.S. Patent No. 3,847,867 arc, in U.S. Patent Re 3,879,428 number of heads, an aromatic diether polycarboxylic acids and anhydrides thereof, aromatic diimine and reaction to, and is introduced to produce a number of soluble and thermally stable polyimide having a high molecular weight that the melt in an organic solvent. 이러한 폴리이미드는 피복제, 접착제, 필름등을 제조하는데, 접합하고, 통상의 성형기에 의하여 유용한 부품을 제조하는데 적합한 것으로 예상된다. These polyester for preparing the polyimide coating, adhesive, film or the like, and bonding is expected to be suitable for the production of useful parts by conventional molding machine. 그러한 방법으로 제조한 공지의 폴리이미드는 낮은 Ｔｇ, 각종 기질에 대하여 부적합한 접착성, 붕량한 내용제성과 같은 결정점을 나타낸다. It represents one of the known production method such as poly low Tg, inadequate adhesion to various substrates, bungryang the information and the decision point imide. 또한, 예를들면, 미국 특허 제 4 017 459호, 제 4064 289호 ; Also, for example, U.S. Patent No. 4 017 459, 1 - 289 No. 4064; 제 4239 880호 ; No. 4239 No. 880; 제 4 405 770호에 방향족 디에테르 디아민을 테트라카르복실산과 이의 유도체와 반응시켜서 용해가능한 폴리(아미드-이미드) 또는 용융할 수 있는 폴리이미드를 제조하는 것이 소개되어 있다. No. 4405 by the aromatic diether diamine in 770 Reaction with tetracarboxylic acid and a derivative thereof soluble poly (amide-imide) can be introduced for preparing the polyimide or which can be melted. 더욱이, 미국 특허 제 3 563 951호에, 용융 및 용해 가능한 열 안정성 폴리이미드는, 고분자량의 디아민 캐프트 방향족 폴리에테르 올리고머를 비-디에테르 함유 방향족 테트라카르복실산 또는 이의 무수 유도체를 반응시켜서 제조하는 것이 소개되어 있다. Further, U.S. Patent No. 3 563 to 951 arc, melting and soluble thermostable polyimide, high molecular weight diamine caviar soft aromatic poly ether oligomer ratio of - prepared by the diether-containing aromatic reacting the tetracarboxylic acid or its anhydride derivative it has been introduced to. 이러한 방향족 디아민에서 용해 및 용융이 가능한 폴리이미드와 폴리(아미드-이미드) 중합체를 제조하는 것은 불확실한 것으로, 이는 다른 연구자에 의하여 발표되었으며, 예를들면, 중합체과학지, 12권, ｐ 575-587(1974)에 소개된 조오지 엘, 브로드 등에 의한 논문에, 설폰일 결합을 갖는 방향족 디에테르 디아민으로 제조된 중합체가 프로판 결합을 갖는 중합체보다 더 용융성이 크다는 것이 보고되었고, 마코몰레쿠라 과학지, 1권, ｐ667-670(1980)에 소개된 논문에, 2,2-비스(4-(ｐ-아미노펜옥시)-페닐] 프로판과 피로멜리트 이무수물과, 4,4'-카르본일디(프탈 이무수물)의 반응으로 불용성 폴리이미드가 제조되는 것이 보고되어 있다. 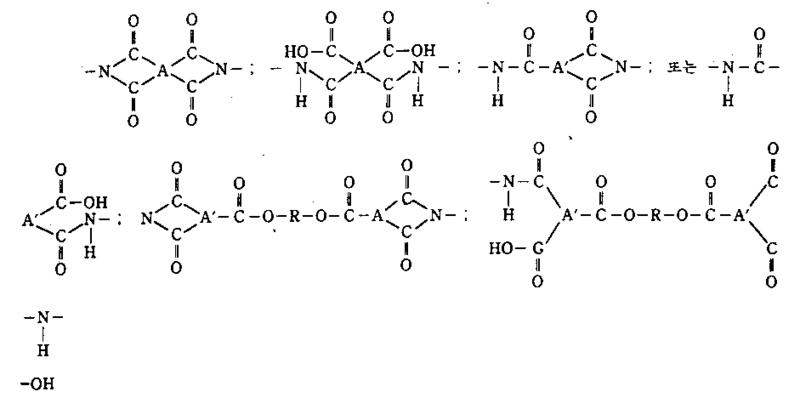 In such an aromatic diamine and dissolved and the melt is possible polyimide poly (amide-imide) as it is for producing a polymer uncertain, which was published by other authors, for instance, if the polymer science, 12, p 575-587 the paper due to (1974) of George L., broad introduced, the polymers made with an aromatic diether diamine having a sulfonyl bond has been reported that greater is more meltable than the polymer having a propane bond, Marco molecular Kurashiki Science branch, 1, p667-670 with the introduction to the paper (1980), 2,2-bis (4- (p- acetaminophen) -phenyl] propane with pyromellitic dianhydride, 4,4'-carboxylic ildi ( phthalic dianhydride)] it is reported that the reaction insoluble polyimide is produced by the. 본 발명에서는, 방향족 또는 지방족 이무수물 또는 산무수물과 다음일반식(ａ)를 갖는 방향족 디이민을 최소한 약 10몰 퍼센트를 함유하는 폴리이미드, 폴리(아미드-이미드) 또는 폴리(아미드-아미드산), 폴리(에스테이미드) 또는 폴리(에스테르아미드산) 조성물을 제공한다. In the present invention, an aromatic or aliphatic dianhydride or acid anhydride with the general formula a polyimide containing at least about 10 mole percent of the aromatic diimine having (a), poly (amide-imide) or poly (amide-amide acid ), poly (eseuteyi imide) or poly (ester amide acid) provides a composition. 상기식에서 Ｒ 1 , Ｒ 2 와 Ｒ 3 는 각각 수소, 할로겐이나 비치환 또는 치환 하이드로카르빌이고 ; Wherein R 1, R 2 and R 3 are each hydrogen, halogen or an unsubstituted or substituted hydrocarbyl, and; Ｘ 1 과 Ｘ 2 는 약 1-30개의 탄소원자를 갖는 치환 또는 비치환 분지쇄 선장 또는 환상 알킬렌 또는 알켄일렌, -Ｓ- 또는 -Ｏ-이고, 이때 Ｘ 1 과 Ｘ 2 는 둘다 동시에 -Ｓ- 또는 -Ｏ-를 나타내지는 않는다. X 1 and X 2 is a substituted or unsubstituted branched master or cyclic alkylene or alkenylene, -S- or -O- having from about 1-30 carbon atoms, and wherein X 1 and X 2 are both at the same time -S- or do not represent a -O-. Ｘ 1 과 Ｘ 2 는 각각 다음 일반식의 2가기가 바람직하다. X 1 and X 2 are each preferably a divalent group of the following formula. 상기식에서 Ｒ 4 과 Ｒ 5 는 각각 수소, 약 12개가지의 탄소 원자를 갖는 치환 또는 비치환 알킬, 약 2-12개의 탄소원자를 갖는 치환 또는 비치환 알켄일, 4-12개의 탄소원자를 갖는 치환 또는 비치환 시클로알킬, 약 5-24개의 탄소원자를 갖는 치환 또는 비치환 탄소환식 방향족기와 또는 복소환식 방향족기와 이들의 혼합기를 나타내며 이때 Ｘ 1 과 Ｘ 2 는 동시에 둘다 수소인 Ｒ 4 과 Ｒ 5 가 될 수 없다. Wherein R 4 and R 5 are each hydrogen, about 12 kinds of substituted or unsubstituted alkyl having a carbon atom, a substituted or unsubstituted alkenyl having from about 2-12 carbon atoms, a substituted having from 4 to 12 carbon atoms or unsubstituted cycloalkyl, represents a substituted or unsubstituted carbocyclic aromatic group or heterocyclic aromatic group and those of the mixture having from about 5-24 carbon atoms, wherein X 1 and X 2 are both at the same time can be a hydrogen and R 4 R 5 none. ｎ,ｎ'와 ｎ"는 각각 1-4의 정수이고, ; Ｒ 4 와 Ｒ 5 는 각각 비치환 또는 치환될 수 있고, 치환될 때, 이러한 치환기는 Ｂｒ, Ｃｌ, Ｉ, Ｆ, 1-8개의 탄소원자를 갖는 알콕시, 1-8개의 탄소원자를 갖는 알킬이다. and n, n 'and n "is an integer from 1 to 4, respectively,; R 4 and R 5 when it is may be unsubstituted or substituted respectively Beach, optionally substituted, the substituent is Br, Cl, I, F, 1-8 alkoxy having from carbon atoms, alkyl having from 1-8 carbon atoms. 바람직하기로는 Ｒ 4 와 Ｒ 5 는 각각 1-8개의 탄소원자를 갖는 치환 또는 비치환 알킬, 2-8개의 탄소원자를 갖는 치환 알켄일, 4-8개의 탄소원자를 갖는 치환 또는 비치환 시클로알킬 또는 이들의 혼합기일때이다. Preferably R 4 and R 5 are each 1-8 carbon atoms having from substituted or unsubstituted alkyl, substituted alkenyl having from 2 to 8 carbon atoms, a substituted or unsubstituted cycloalkyl, or those having from 4 to 8 carbon atoms when the mixer. 일반식(ａ)의 적합한 디아미노 화합물의 에를들면 다음과 같다. Ereul example: the appropriate diamino compound of formula (a). 전술한 일반식(ａ)의 방향족 디아민과 반응하는데 유용한 이 무수물과 산무수물은 일반식으로 표시된다. To react with an aromatic diamine of the above formula (a) useful for the anhydride and the acid anhydride is represented by the following formula. 상기식에서 Ａ와 Ａ'는 치환 또는 비치환 방향족 또는 지방족 이무수물(Ａ에서) 또는 산무수물(Ａ'에서)로부터 유도된 4가 및 2가기이다. Wherein A and A 'is a substituted or unsubstituted aromatic or aliphatic dianhydride (A in) or anhydride (A' is derived from a 4 in) and a second store. 다라서, Ａ는 다음 일반식의 치환 또는 비치환 4가기일 수 있다. It is most desirable, A may be a substituted or unsubstituted 4 to the top of the following general formula. 약 1-30개의 탄소원자를 갖는 치환 또는 비치환 선상, 분지상 또는 환상 알킬렌이나, 약 2-30개의 탄소원자를 갖는 알케닐렌을 나타낸다. It represents the alkenylene group having from about 1 to 30 carbon atoms having from substituted or unsubstituted linear, branched or cyclic alkylene, or about 2 to 30 carbon atoms. 또한, 예를들면, Ａ는 치환 또는 비치환 벤젠이나 나프탈렌 핵, 시클로펜탄, 시클로헥산, 부탄등과 같은 지방족기를 나타낸다. Also, for example, A represents an aliphatic, such as substituted or unsubstituted benzene or naphthalene nucleus, cyclopentane, cyclohexane, butane and the like. Ａ상의 치환기를 본 발명의 중합체 제조에서 이무수물의 사용을 방해하지 않는 하나 또는 그 이상 기를 뜻한다. The substituent on the A a dianhydride that does not interfere with the use of water in the polymer preparation of the invention or more means a group. Ｏ-, 등이 있다. There are O-, and the like. 3,3',4,4'-베조페논 테트라카복실 이무수물, 2,2',3,3'-벤조페논 테트라카르복실 이무수물, 3,3',4,4'-디페닐 테트라카르복실 이무수물, 2,2',3,3'-디페닐 테트라카르복실 이무수물, 2,2'-비스-(3,4-디카로복시페닐) 프로판 이무수물, 2,2'-비스-(2,3-디카르복시페닐) 프로판 이무수물, 2,2-비스-(트리메리트 옥시페닐) 프로판 이무수물, 비스-(3,4-디카르복시페닐) 에테르 이무수물, 비스-(3,4-디카르복시페닐) 설폰 이무수물, 비스-(3,4-디카르복시페닐) 설파이드 이무수물, 1,1-비스-(2,3-디카르복시페닐)에탄 이무수물, 1,1-비스-(3,4-디카르복시페닐) 에탄 이무수물, 비스-(2,3-디카르복시페닐) 메탄 이무수물, 비스-(3,4-디카르복시페닐) 메탄 이무수물, 2,3,6,7-나프탈렌 테트라카르복실 이무수물, 1,2,4,5-나프탈렌 테트라카르복실 이무수물, 1,2,5,6-나프탈렌 테트라카르복실 이무수물, 3,3 ', 4,4'-tetra-chopping jope non carboxyl dianhydride, 2,2', 3,3'-benzophenone tetracarboxylic dianhydride, 3,3 ', 4,4'-biphenyltetracarboxylic acid dianhydride, 2,2 ', 3,3'-diphenyl tetracarboxylic dianhydride, 2,2'-bis (3,4-dicarboxylic diplopia phenyl) propane dianhydride, 2,2'-bis - (2,3-dicarboxyphenyl) propane dianhydride, 2,2-bis (trimellitic oxyphenyl) propane dianhydride, bis- (3,4-dicarboxyphenyl) ether dianhydride, bis- (3,4 - dicarboxyphenyl) sulfone dianhydride, bis- (3,4-dicarboxyphenyl) sulfide dianhydride, 1,1-bis- (2,3-dicarboxyphenyl) ethane dianhydride, 1,1-bis- ( 3,4-dicarboxyphenyl) ethane dianhydride, bis- (2,3-dicarboxyphenyl) methane dianhydride, bis- (3,4-dicarboxyphenyl) methane dianhydride, 2,3,6,7- naphthalene tetracarboxylic dianhydride, 1,2,4,5-naphthalene tetracarboxylic dianhydride, 1,2,5,6-naphthalene tetracarboxylic dianhydride, 벤젠-1,2,4,5-테트라카르복실 이무수물, 벤젠-1,2,3,4-테트라카복실 이무수물, 페릴렌-3,4,9,10-테트라카르복실 이무수물, 피라진-2,3,5,6-테트라카복실 이무수물, 티오펜-2,3,4,5-테트라카르복실 이무수물, 나프탈렌-1,4,5,8-테트라카르복실 이무수물, 데카하이드로 나프탈렌-1,4,5,8-테트라카르복실 이무수물, 4,8-디메틸-1,2,3,5,6,7-헥사하이드로나프탈렌-1,2,5,6-테트라카르복실 이무수물, 2.6-디클로로나프탈렌-1,4,5,8-테트라카르복실 이무수물, 2,7-디클로로나프탈렌-1,4,5,8-테트라카르복실 이무수물, 2,3,6,7-테트라클로로나프탈렌-1,4,5,8-테트라카복실 이무수물, 페난트렌-1,8,9,10-테트라카르복실 이무수물, 시클로펜탄-1,2,3,4-테트라카르복실 이무수물, 피롤리딘-2,3,4,5-테트라카르복실 이무수물, 피라진- 2,3,5,6-테트라카르복실 이무수물, 1,2,3,4-부탄 테트카르복실 이무수물, 3,4 -1,2,4,5- benzene tetracarboxylic dianhydride, benzene-1,2,3,4-tetra-carboxylic dianhydride, perylene -3,4,9,10- tetracarboxylic dianhydride, pyrazine- 2,3,5,6-carboxylic dianhydride, thiophene-2,3,4,5-tetracarboxylic dianhydride, naphthalene-1,4,5,8-tetracarboxylic dianhydride, decahydronaphthalene- 1,4,5,8-tetracarboxylic dianhydride, 4,8-dimethyl -1,2,5,6 -1,2,3,5,6,7- hexahydro-naphthalene tetracarboxylic dianhydride, 2.6-dichloro-naphthalene-1,4,5,8-tetracarboxylic dianhydride, 2,7-dichloro-naphthalene-1,4,5,8-tetracarboxylic dianhydride, 2,3,6,7-tetrachloro naphthalene-1,4,5,8-tetra-carboxylic dianhydride, phenanthrene -1,8,9,10- tetracarboxylic dianhydride, cyclopentane-1,2,3,4-tetracarboxylic dianhydride, P pyrrolidine-2,3,4,5-tetracarboxylic dianhydride, pyrazine-2,3,5,6-tetracarboxylic dianhydride, 1,2,3,4-butane Tet dianhydride, 3, 4 ,3'4',-벤조페논 테트라카르복실 이무수물, 이조벤젠 테트라카르복실 이무수물, 2,3,4,5-테트라하이드로푸란 이무수물, ｐ-페닐렌-비스-(트리메리테이트) 무수물, 1,2-에틸렌-비스(트리멜리테이트) 무수물, 2,2-프로판-비스-(ｐ-페닐렌 트리멜리테이트) 무수물, 4,4'-[ｐ-페닐렌-비스-(페닐이미노)카르본일 디프탈] 무수물, 4,4'-디페닐메탄-비스-(트리멜리트 아미드) 무수물과 이들의 혼합물, 또한 Ａ는 다음 일반식의 4가 잔지를 나타낸다. , 3'4 ', - benzophenone tetracarboxylic dianhydride, detuning benzene tetracarboxylic dianhydride, 2,3,4,5-tetrahydrofuran dianhydride, p- phenylene-bis- (tri Mary Tate) anhydride , 1,2-ethylene-(phenylene-bis- (trimellitate) anhydride, 2,2-propane-bis - (p- phenylene trimellitate) anhydride, 4,4 '- [p- phenylene-bis represents a (trimellitic amide) and mixtures of these anhydrides, and a represents the following general formula (4) Zanzibar - mino) carbonyl bonil deep de] anhydride, 4,4'-diphenylmethane-bis. 와 같은 1-30개의 탄소원자를 갖는 치환선상 또는 분자상 알켄렌, -Ｃ-, 또는 약 2-30개의 탄소원자를 갖는 알켄일렌을 나타낸다. And it represents a substituted alkenylene having from linear or molecular Al kenren, -C-, or from about 2 to 30 carbon atoms having from 1 to 30 carbon atoms such. 가 있다. A. 또한 유용한 이무수물을 제공하기 위하여 에테르 결합을 -ＣＯＯ-로 대치할 수 있다. Also it may be substituted by an ether bond -COO- to provide useful dianhydrides. 벤조페논 테트라카르복실산 이무수물, 디페닐 테트라카르복실산 이무수물, 비스(3,4-디카르복시페닐) 설폰 이무수물, 2,2'-비스(트리멜리트 옥시페닐) 프로판 이무수물, 2,2-비스(3,4-디카르복시페닐) 프로판이무수물, 2,2-비스[4,4'-디(3,4-디카르복시펜옥시)페닐]프로판 이무수물, ｐ-비스(3,4-디카르복시펜옥시)페닐 이무수물, 4,4'-비스 3,4-디카르복시펜옥시) 비페닐 이무수물, 비스-[4,4'-디(3,4-디카르복시펜옥시) 페닐] 설폰 이무수물, 비스[4,4'-디(3,4디카르복시펜옥시) 페닐] 설파이드 이무수물, 폴리(아미드-이미드)와 폴리(아미드-아미드산)은 디아민과 산 무수물의 반응 생성물이다. Benzophenone tetracarboxylic acid dianhydride, diphenyl tetracarboxylic acid dianhydride, bis (3,4-dicarboxyphenyl) sulfone dianhydride, 2,2'-bis (trimellitic oxyphenyl) propane dianhydride, 2 , 2-bis-bis (3,4-dicarboxyphenyl) propane dianhydride, 2,2-bis [4,4-di (3,4-dicarboxy phenoxy) phenyl] propane dianhydride, p- (3 , 4-carboxy phenoxy) phenyl dianhydride, 4,4'-bis 3,4-dicarboxy phenoxy) biphenyl dianhydride, bis- [4,4'-di (3,4-dicarboxy phenoxy ) phenyl] sulfone dianhydride, bis [4,4'-di (3,4-dicarboxy phenoxy) phenyl] sulfide dianhydride, poly (amide-imide) and poly (amide-amide acid) is a diamine and an acid anhydride of the reaction product. 상기식에서 Ａ'는 전술한 바와같고 Ｆ는 관능기로서 -ＯＨ, 염소, 취소, 옥소, 불소, -Ｏ-(Ｃ 1 -Ｃ 8 )알킬, -ＣＮ, -ＮＣＳ, ＳＨ, 치환 또는 비치환 아미노기등을 나타낸다. Wherein A 'is as defined above as the functional group F is -OH, chlorine, clear, oxo, fluoro, -O- (C 1 -C 8) alkyl, -CN, -NCS, SH, substituted or unsubstituted amino group such as It denotes a. 트리멜리트 무수물 일산 염화무, 트리멜리트 무수물, 2,6,7-나프탈렌 트리카르복실 무수물, 3,3',4-디페닐 트리카르복실 무수무르 3,3',4-벤조페논 트리카복실 무수물 1,3,4-시클로펜탄 테트라카르복실 무수물, 2,2',3-디페닐 트리카르복실 무수물, 디페닐 설폰-3,3',4트라카르복실 무수물, 디페닐 이소프로 필리덴-3,3',4-트리카르복실 무수물, 3,4,10-프로필렌 트리카르복실 무수물, 3,4-디카르복시페닐-3-카르복실시페닐에테르 무수물, 에틸렌 트르카르복실 무수물, 등. Trimellitic anhydride chloride monoxide-free, trimellitic anhydride, 2,6,7- naphthalene tricarboxylic anhydride, 3,3 ', 4-diphenyl tricarboxylic anhydride ripened 3,3', 4-benzophenone tree carboxyl anhydride, 1,3,4-cyclopentane tetracarboxylic dianhydride, 2,2 ', 3-diphenyl tricarboxylic anhydride, diphenyl sulfone 3,3', 4, Tra-carboxylic anhydride, diphenyl isopropenyl Philippe Baden- 3,3 ', 4-tricarboxylic anhydride, 3,4,10- propylene tricarboxylic anhydride, 3,4-dicarboxyphenyl-3-carboxylic embodiment ether anhydride, ethylene Trois-carboxylic anhydride, and the like. 또한 폴리이미드와 연관된 전술한 디에테르 함유 무수물과 유사한 무수물을 사용할 수 있다. 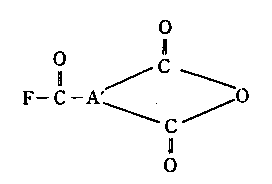 Also can be used and the similar anhydride-containing aforementioned diether associated with a polyimide anhydride. 전술한 방향족 또한 지방족 이무수물 또한 산 무수물과 일반식(ａ)의 방향족 디아민 또는 이의 혼합물과 다른 디아민과의 반응 생성물을 함유하는 폴리이미드, 폴리(아미드-이미드) 또는 폴리(에스테르이미드)와 같은 중합체는 전체적으로 놀랍고 예상외의 성질을 나타낸다. The foregoing aromatic Also aliphatic dianhydride addition polyimide, polyester containing an acid anhydride and an aromatic diamine or a mixture thereof and the reaction product with the other diamine of formula (a) (amide-imide) such as or poly (imide) the polymer as a whole shows a surprising and unexpected properties. 본 발명의 폴리이미드 또는 폴리이미드 또는 폴리(아미드-이미드)는 열가송성 또는 가열 용융 가공성을 가지며 통상 염소화 수소, 쌍극성 비 양성자성, 용매, 알킬 캐프트 폴리에틸렌 글로콜(알킬 캐프트 글림)용매와 이들의 혼합물 및 용매와 각종 탄소수와의 혼합물에 용해한다. Of the present invention, a polyimide or a polyimide or poly (amide-imide) is thermally XiXi Campus or has a heat melting processability conventional chlorinated hydrogen, dipolar aprotic solvents, alkyl caviar soft polyethylene global call (alkyl caviar soft diglyme) solvent, and it is dissolved in a mixture of solvents and the mixtures thereof and the various carbon atoms. 또한 이들 중합체는 각종 유기 및 무기 기질에 대하여는 강력한 접착력을 나타내고 우수한 열안정성을 나타내며, 따라서, 접착제, 피복제, 필름, 섬유질등으로서 사용할 수 있다. In addition, these polymers may be used as show strong adhesion with respect to various kinds of organic and inorganic substrates exhibit excellent thermal stability, and therefore, adhesives, coatings, films, fibers and the like. 본 발명의 폴리아미드산, 폴리(아미드-아미드산)과 폴리(에스테르아미드산)은 가열 또는 호학적 화화 방법에 의하여 열가소정 및 용해성폴리이미드, 폴리(아미드-이미드) 또는 폴리(에스테르이미드)로 아주 쉽게 변환한다. Polyamide acid, polyester of the invention (amide-amide acid) and poly (ester amide acid) are given thermoplastic by heating or arc chemical hwahwa method and a soluble polyimide, poly (amide-imide) or poly (imide) very easy to convert. 또한 본 발명은 원하는 중합체를 제조하는데 필요한 시간동안 전술한 일반식(ａ)을 갖는 방향족 디아민과 전술한 형의 이무수물 또는 산 무수물을 반응시켜서 하는, 용해성 및 용융 가공성 폴리이미드, 폴리(아미드-이미드) 또는 폴리(에스테르이미드)와, 용해성 및 가공성 폴리미니드, 폴리(아미드-이미드) 또는 폴리(에스테르이미드)로 쉽게 변환하는 폴리아미드 산, 폴리(아미드-아미드산)의 제조방법을 제공한다. In another aspect, the present invention is an aromatic diamine and that by reacting the dianhydride or an acid anhydride of the aforementioned type, soluble and melt processible polyimide having the formula (a) described above for the time necessary to prepare the desired polymer, a poly (amide-already provides a process for the preparation of polyamic acid) - de) or poly (imide), and solubility and processability poly mini dE, poly (amide-imide) or poly (imide) as easy to convert the polyamide acid, poly (amide do. 전술한 바와같은 특별한, 방향족 디아민 또는 이의 다른 다아민과의 혼합물을 본 발명에 의하여 이무수물 또는 산무수물과, 반응시킬 때, 예상외로 용융 가공성 및 용해성을 둘다 갖는 폴리이미드, 폴리아미드산, 폴리(아미드-이미드), 폴리(아미드-아미드산), 또는 폴리(에스테르이미드) 또는 폴리(에스테르아미드산)이 제조됨을 알 수 있다. 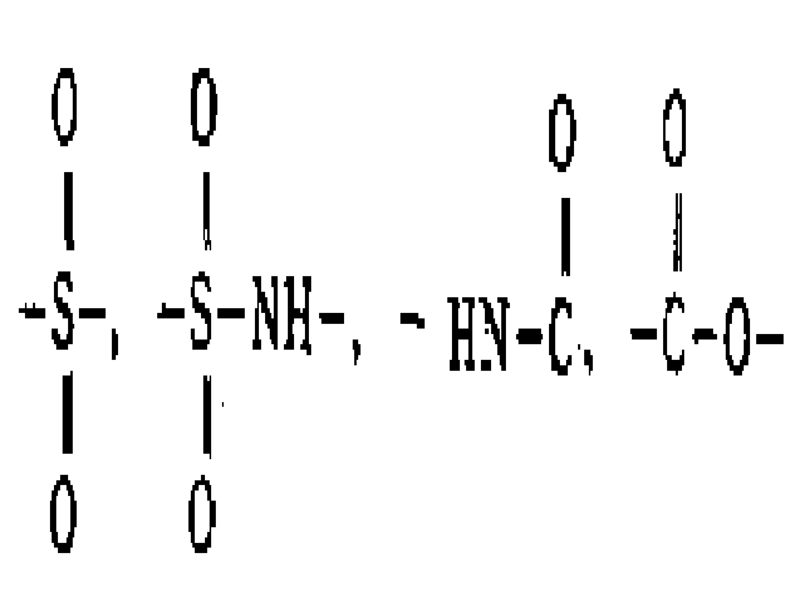 Particular, an aromatic diamine, or when the dianhydride or an acid anhydride, a reaction by the mixture with its other multi-amine to the invention, having unexpectedly both the melt processible and soluble polyimide, polyamide acid, poly (amide as described above - it can be seen that amide acid), or poly (imide) or poly (ester amide acid) is prepared-imide), poly (amides. 더우기 중합체는 통상 용융 중합법 및 용액 중합법을 사용하여 제조한다. Further polymers are prepared using a conventional melt polymerization method and solution polymerization method. 본 발명의 폴리이미드, 폴리아미드-산, 폴리(아미드-이미드), 폴리(아미드-아미드산), 폴리(에스테르-이미드)와 폴리(에스테르아미드)는 방향족 또는 지방족 이무수물 산물수물이나 이의 혼합물과 전술한 일반식(ａ)을 갖는 방향족 디아민과의 반응 생성물을 최소한 약 10몰 퍼센트를 함유하는 중합체이다. Polyimides, polyamides of the invention acid, poly (amide-imide), poly (amide-amide acid), poly (ester-imide) and poly (ester amide) is a product sumul or its aromatic or aliphatic dianhydride a polymer containing about 10 mole percent of the mixture and at least one above-described general formulas (a) the reaction product of an aromatic diamine having. 이 중합체가 다음 일반식의 잔기 및 이의 혼합기를 최소한 약 10몰 퍼센트를 함유하면 성질이 개량된다. When the polymer is contained at least about 10 mole percent of the residues and their mixture of the following general formula is the improved properties. 본 발명의 중합체는 다음 일반식으로 표시되는 반복단위로 구성된다. The polymers of the present invention is composed of a repeating unit represented by the following formula. 상기식에서 Ａ,Ａ',Ｒ,Ｒ 1 ,Ｒ 2 ,Ｒ 3 ,ｎ,ｎ',ｎ", Ｘ 1 과 Ｘ 2 는 전술한 바와 같고 ; ｋ,ｋ',ｋ",ｋ"',ｋ"',과 ｋ"'"'는 1 또는 그 이상의 양의 정수이고 상기 중합체에서 다른 중합체 블록의 수를 나타내며 ; Wherein A, A ', R, R 1, R 2, R 3, n, n', n ", X 1 and X 2 are as defined above; k, k ', k" , k "', k " ', and k"' " 'is one or more positive integer and represents the number of different polymer blocks in said polymer; ｒ,ｒ',ｒ",ｒ"',ｒ""와 ｒ""'은 1 이상의 같거나 다른 정수이고 ; r, r ', r ", r"', r "" and r "" 'are the same or different at least one integer; 바람직하기로는 이들이 약 10-10,000 또는 그 이상일때이고, ; Preferably it is about 10 to 10,000 or more than that ttaeyigo; ｒ,ｒ',ｒ",ｒ"',ｒ"",와 ｒ""'는 중합체 쇄에소 단위가 번복되는 화수를 나타낸다. 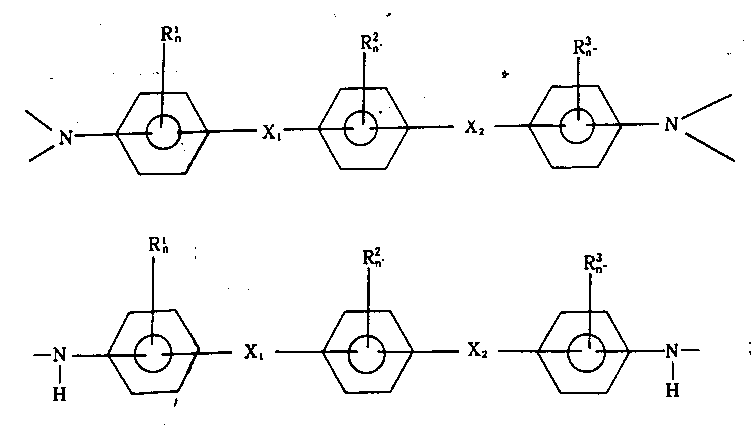 r, r ', r ", r"', r "", and r "" 'represents a hwasu that small reverse unit in the polymer chain. 본 발명의 중합체를 다음 일반식의 반복 구조 단위가 상호 결합된 약 90몰 퍼센트까지 갖는 일반식(ｂ), 일반식(ｃ), 일반식(ｄ), 일반식(ｅ), 일반식(ｆ), 일반식(ｇ) 또는 이의 혼합물의 반복 구조 단위로 구성된 중합체도 포함한다. Formula having the polymer of the present invention up to about 90 mole percent of the repeating units of the following formula the mutual coupling (b), the general formula (c), Formula (d), Formula (e), Formula (f ), also it includes a polymer consisting of the general formula (g) or repeating units of a mixture thereof. 상기식에서 Ａ,Ａ'와 Ｒ은 전술한 바와 같고; Wherein A, A 'and R are as defined above; ｓ,ｓ',ｓ",ｓ"',ｓ""와 ｓ""'은 1이상의 같거나 다른 정수이고 중합체 쇄에서 단위가 반복되는 회수를 나타내며 ; s, s', s ", s" ', s "" and s ""' are the same or different integer of 1 or more and represents the number of times that the unit in the polymer chain repeat; 바람직하기로는 이들이 10-10,000 또는 그 이상일때이고, ; Preferably, they are greater than those 10-10000 or ttaeyigo; Ｂ는 약 2-20개의 탄소원자를 갖는 알킬렌 또는 알커닐렌, 4-8개의 탄소원자를 갖는 시클로알킬렌, -Ｎ-, -Ｓ-와 -Ｏ-와 같은 이종원자를 갖는 약 4-20개의 탄소원자를 갖는 복소환식알킬렌, 약 4-500개의 탄소원자를 갖는 폴리옥시알킬렌, 바람직하기로는는 약 6-40개의 탄소원자를 탄소환식 방향 족기를 포함하여, 일반식 Ｈ 2 Ｎ-Ｂ-ＮＨ 2 (여기서 Ｂ는 지방족 또는 지환식기이다)를 갖는 디아민(이후 “다른 디아민”이라 칭한다)으로부터 유도된 2가지이다. B is from about 4 to 20 carbon atoms having from cycloalkylene, -N-, heteroatom, such as -O- and -S- or alkylene having from alkeo alkenylene, 4-8 carbon atoms having from about 2-20 carbon atoms those having heterocyclic alkylene, polyoxyalkylene, preferably hagironeunneun about 6-40 carbon atoms having from about 4-500 carbon atoms, including an carbocyclic group direction, the general formula H 2 N-B-NH 2 ( wherein B is It is derived from the two kinds of the diamine (hereinafter referred to as "other diamine") having an aliphatic or alicyclic group). 다른 디이민은, Ｂ가 치환 또는 비치환 페닐렌, 비페닐렌, 나프탈렌, 안도라세닐렌 등 또는 다음 일반식의 기인 천연적 방향족 화합물이 바람직하다. Other di-imine, is B is a substituted or caused naturally occurring aromatic compounds unsubstituted phenylene, biphenylene, naphthalene, alkylene Andorra hexenyl and the like, or the following general formula are preferred. 아릴 핵중 어느것은 저급 알킬, 저급 알콕시 또는 다른 불간섭 치환기로 치환될 수 있고 알킬렌기는 할로겐에 의해여 치환될 수 있다. Any aryl haekjung it can be replaced by W may be substituted and an alkylene group consisting of halogen lower alkyl, lower alkoxy or any other substituent non-interference. 또한 Ｂ는 다음 일반식의 2가 잔기를 나타낸다. Also B has the following represents a divalent residue of the formula. 상기식에서 Ｇ'는 치환 또는 비치환 페닐렌 다음 일반식의 기를 나타낸다. Wherein G 'represents a substituted or unsubstituted phenylene following formula. 적합한 다른 디아민으로는 다음과 같은 방향족 디에테르 디아민이 있다 : 4,4'-비스-(ｐ-아미노펜옥시)디페닐 설파이드, 4,4'-비스(3"-아미노펜옥시)디페닐 설파이드, 4,4'(3"-아미노펜옥시. 4'-아미노펜옥시)-디페닐 설파이드, 4,4'-비스-(ｐ-아미노펜옥시)디페닐 설폰, 4,4'-비스-(3"-아미노펜옥시)디페닐 설폰, 2,2-비스-[4'-(ｐ-아미노펜옥시)페닐]프로판, 2,2-비스0[3'-(ｐ-아미노펜옥시)페닐]프로판, 1,1-비스-[4'(ｐ-아미노펜옥시)페닐)에틸벤젠. Suitable other diamine has the following aromatic diether diamine such as: 4,4'-bis - (p- acetaminophen-phenoxy) diphenyl sulfide, 4,4'-bis (3 "- acetaminophen-phenoxy) diphenyl sulfide, 4 , 4 '(3 "- acetaminophen acetaminophen oxy-4'-oxy) diphenyl sulfide, 4,4'-bis- (p- acetaminophen oxy) diphenyl sulfone, 4,4'-bis- (3" - acetaminophen oxy) diphenyl sulfone, 2,2-bis - [4 '- (p- acetaminophen) phenyl] propane, 2,2-bis 0 [3' - (p- acetaminophen) phenyl] propane, 1,1- bis - [4 '(p- acetaminophen) phenyl) ethyl benzene. 잔기 Ｂ는 이종원자가 하나 또는 그 이상의 -Ｎ-, -Ｏ-와 -Ｓ-인 6-20개의 탄소원자를 갖는 이종환식 방향족기로서, 피리딘, 피리미딘, 피라진, 옥사디아진, 옥사티아진, 트리아진, 벤조푸란, 티오나프텐, 인돌, 퀴놀린, 벤즈옥사졸, 벤조티오펜, 카르바졸 등과 같은 것이 있다. Moiety B is a heteroatom Woman one or a heterocyclic type aromatic groups with more of -N-, -O- and -S- of 6-20 carbon atoms, pyridine, pyrimidine, pyrazine, oxazole diazine, oxazolyl thiazine, tri- It may be such as triazine, benzofuran, thio naphthene, indole, quinoline, benzoxazole, benzothiophene, carbazole. 또한 Ｂ는 다음 일반식으로 표시되는 미국 특허 제4 385 527호에 예시된 비스(아미노)폴리실옥산의 잔기가 있다. Also B has the U.S. Patent No. 4 385 The bis (amino) moiety of the polysiloxane illustrated in No. 527 represented by the following formula. 이고; ego; Ｄ는 비치환 또는 치환 하이드로카르젠빌렌이고; D is unsubstituted or substituted hydrocarbyl Zen bilren gt; Ｒ ６ ,Ｒ 7 ,Ｒ 8 ,Ｒ 9 ,Ｒ 10 과Ｒ 11 은 각각 치환 또는 비치환 하이드로카르빌이고; R 6, R 7, R 8 , R 9, R 10 and R 11 are each a substituted or unsubstituted hydrocarbyl, and; ｈｉ와 ｊ는 각각 0-100의 값을 갖는다. hi, j has a value of 0 to 100, respectively. 또한 Ｂ는 다음 일반식의 디(아미노알킬)폴리실옥산의 잔기를 나타낸다. 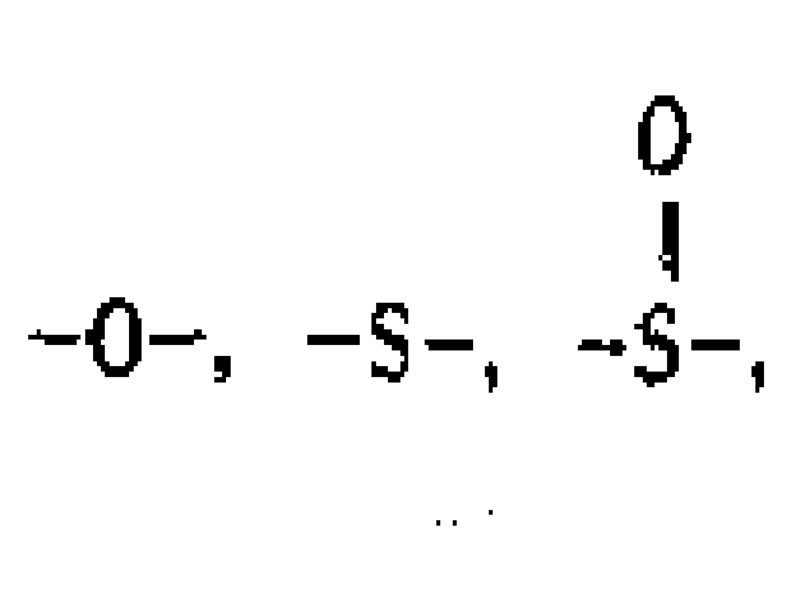 In addition, B represents a di (aminoalkyl) residues of the polysiloxanes of the following general formula. 상기식에서 Ｒ 6 는 전술한 바와 같고; Wherein R 6 is as defined above; Ｒ 12 는 2가 탄화수소이고; R 12 is a divalent hydrocarbon group; ｔ는 1 또는 그 이상이다. t is 1 or more. 본 발명의 실시에 의하여, 본 발명의 유용한 폴리이미드, 폴리아미드산, 폴리(아미드-이미드), 폴리(아미드-아미드산), 폴리(에스테르이미드)와 폴리(에스테르아미드산)을 조성함에 있어 화학자들이 이용할 수 있도록 많은 변화를 가할 수 있음을 알 수 있다. By practice of the invention, useful polyimide of the present invention, the polyamide acid, poly (amide-imide), poly (amide-amide acid) it as the composition of the poly (imide) and poly (ester amide acid) it can be seen that chemists can apply many changes to be available. 일반식(ａ）의 방향족 디아미은 아주 놀랍고 예상외의 성질을 나타내는 중합체를 제조하는데 사용할 수 있다. 여기에 제조된 폴리이미드, 폴리(아미드-이미드)와 폴리(에스테르이미드)와 같은 중합체는 염소화 탄화수소 용매, 쌍극성 비양성자성 용매, 알킬 캐프트 글림등과 같은 여러 가지 용매에 용융 및 용해할 수 있다. 이러한 중합체는 다른 공지의 폴리이미드와 폴리(아미드-이미드)에 나타나는 것 보다 우수하고 양호한 접착성 및 우수한 열 안전성을 나타낸다. 따라서, 전술한 디아민 잔기를 함유하는 폴리이미드, 폴리(아미드-이미드)와 폴리(에스테르이미드)는 통상의 용융 가공법을 사용하여 높은 열 안전성을 나타내는 성형물로 아주 쉽게 제조할 수 있고 강력한 접착력과 열 안전성이 중요시되는 피복물 및 접착물에사용할 수 있다. . Aromatic dia mieun of formula (a) may be used in preparing the polymer represents a very surprising and unexpected properties of the polyimide prepared herein, the poly (amide-imide) and poly polymers such as (imide) is a chlorinated hydrocarbon solvent, , dipolar non-positive can be molten and dissolved in various solvents, such as magnetic solvents, alkyl caviar soft diglyme, etc. the polymer is polyimide of the other known as poly - superior to those that appear in the (amide-imide), and good adhesion represents the resistance and excellent thermal stability thus, containing the above-mentioned diamine residues polyimide, poly (amide-imide) and poly (imide) is very easy to moldings having a high thermal stability using conventional melt-processing methods It can be produced and can be used in coating and adhesive to be important this strong adhesion and thermal stability. 본 발명의 용융 가공성 중합체는 성형, 추출, 캘린더 등과 같은 일반적인 기술에 의하여 쉽게 성형시킬 수 있다. Of the present invention melt processible polymers can be easily formed by common molding techniques such as, extraction, calendar. 이들 중합체로부터 제조한 제품은 주변 환경에 의하여 일어나는 토화에 대한 내성은 물론 양호한 내열성을 나타낸다. Products made from these polymers are resistant to rabbit takes place by the surrounding environment and exhibits good heat resistance. 전술한 용매에 이들 중합체에 용해시킨 용액은 전기 및 전자 성분을 포함하는 여러 가지 기질을 피복하는데 사용할 수 있고; The aforementioned solvent dissolved in these polymers can be used to coat a variety of substrates including electrical and electronic components; 또한 이러한 용액은 필름 또는 방사 섬유를 제조하는데 사용할 수 있다. In addition, this solution can be used to manufacture the film, or spun fiber. 이들 중합체 조성물은 폴리이미드, 폴리(아미드-이미드)와 폴리(에스테르이미드)수지로부터 제조된 것을 함유하는 각종 기질에 대하여 우수한 접착성을 나타내며, 따라서 다른 금속 및 비금속 재료에 1차 또는 2차 접착제나 피복제로서 사용할 수 있다. These polymer compositions are polyimide, poly (amide-imide) and poly (imide) exhibits excellent adhesion to various substrate containing those made from the resin, and therefore the first or second adhesive to the other metal and non-metallic materials or it can be used as a coating agent. 더욱이, 일반식(ａ)의 방향족 디아민과 광범위한 이무수물 또는 산 무수물로부터 유도된 플리이미드, 풀리(아미드-이미드) 또는 폴리(에스테르이미드)가 방향족 디아민의 일부분을 하나 또는 그 이상의 다른 디아민으로 대치할 때에도 용해성 및 열가소성 또는 용융 가공성을 나타내는 것을 놀라운 것이다. Furthermore, it derived from an aromatic diamine and a wide range of dianhydride or an acid anhydride of the formula (a) peulriyi Meade, pulleys (amide-imide) or poly (imide) is substituted for another diamine, one or more of a portion of the aromatic diamine even when surprising that represent the soluble and thermoplastic or melt processible. 염소화 탄화수소, 쌍극성 비양성자성 용매 등의 용매에서 용융 및 용해하는 본 발명의 폴리이미드, 폴리(아미드-이미드)와 폴리(에스테르이미드)는 일반식(ａ)을 갖는 것 이의의 디아민을 약 90몰 퍼센트까지 함유하는 디아민을 제조할 수 있다. A chlorinated hydrocarbon, a pair of the polarized non-positive present invention for melting and dissolving in a solvent such as magnetic solvents polyimide, poly (amide-imide) and poly (imide) is of the counter having the formula (a) a diamine of about a diamine containing up to 90 mole percent can be prepared. 따라서, 본 발명 중합체의 성질은 선택한 반응물을 특별히 결합시킴에 의하여, 매우 광범위하게 변화시킬 수 있다. Thus, the nature of the polymer in this invention may be, changes very widely by Sikkim specifically binding the selected reactant. 반응물을 조절함과 더불어, 다른 중합체를 혼합시키므로서 본 발명 중합체의 성질을 변경시킬 수 있다. In addition to also control the reaction, it is possible to change the document properties of the present invention because the polymer blend the different polymers. 다른 폴리이미드, 폴리(아미드-이미드)와 폴리(에스테르이미드)를 혼합하여 원하는 성질을 제공할 수 있다. Other polyimides, poly (amide-imide) and a mixture of poly (imide) can provide the desired properties. 본 발명의 폴리이미드산과 폴리이미드 조성물을 제조하기 위하여 이무수물 성분과 방향족 디아민 성분의 반응을 적합한 용매와 축합 촉매의 존재하에 실시하는 것이 효과적이다. It is effective to conduct in the presence of a dianhydride component and aromatic diamine component in a suitable reaction solvent and the condensation catalyst to prepare a polyimide acid and polyimide compositions of the present invention. 용매는 반응물은 물론 생성물도 용해시킨다. The solvent is then of course the reaction product is also dissolved. 적합한 용매의 에를들면, Ｎ,Ｎ-디메틸포름아미드(ＤＭＦ), 디메틸아세트아미드, Ｎ-메틸-2피롤리돈, 헥사메틸포스포트리아미드, 디메틸 설폭사이드(ＤＭＳＯ), 테트라메틸우레아등과 같은 쌍극성 비양성자성 액체 ; Ereul g., N, N- dimethylformamide (DMF), dimethylacetamide, N- methyl-2-pyrrolidone, hexamethylphosphoric Fort Lee, dimethyl sulfoxide (DMSO), pairs such as tetramethylurea, etc. in a suitable solvent polar aprotic liquid; 클로로벤젠, 디클로로벤젠, 트리클로벤젠등과 같은 염소화 용매 ; Chlorinated solvents such as chlorobenzene, dichlorobenzene, trichlorobenzene; 에틸렌 글리콜 디메틸 에티르, 디에틸렌 글리콜 디메틸 에테르등과 같은 글림 및 이들의 혼합물이 있다. In ethylene glycol dimethyl the glymes, and mixtures thereof, such as Tyr, diethylene glycol dimethyl ether and the like. 반응물을 조합할 때, 예를들어 무수물과 아민을 조합할 때 성분들의 반응성에 주의해야 한다. When combining the reactants, for example, care must be taken to the reactivity of the components when combining the anhydride and the amine. 본 발명의 중합체를 합성할 때, 전체 무수물 성분과 전체 아민을 등분자량으로 통상 사용한다. When the synthesis of the polymers of the present invention, there is usually used a total anhydride component and total amine in equal parts jaryang. 측합반응시 성분중 하나가 약간 초과하면 해롭지 않으나, 상당히 초과하면 저분자량의 생성물 또는 불필요한 부산물이 생성된다. Hapban harmful side but if one of the components to take a little greater than, the product or an unwanted by-product of low molecular weight are produced when considerably exceeded. 본 발명의 폴리이미드, 폴리(에스테르이미드)와 폴리아미드산을 제조하는데 사용되는 디아민 성분의 전부 또는 일부가 일반식(ａ)의 방향족 디아민 화합물일 때, 중합체는 하나 또는 그 이상의 다른 디아민을 갖는이 방향족 디아민 성분의 잔기 약 10몰 퍼센트에서 다른 디아민 성분을 갖지 않는 이 방향족 디아민 성분 100몰 퍼센트까지 함유한다. Having a polyimide, a poly (imide) and the aromatic diamine compound one time, the other polymers include one or more diamines of the polyamide diamine component in whole or in part, the general formula (a), used to prepare the acid of the present invention It contains from about 10 mole percent of the residues of the aromatic diamine component to the 100 mole percent of the aromatic diamine component with no other diamine components. 따라서, 약 10몰 퍼센트에서 100몰 퍼센트까지 방향족 디아민 성분 또는 이의 혼합물을 사용할 수 있다 ; Therefore, it is possible to use an aromatic diamine component or mixtures thereof from about 10 mole percent to 100 mole percent; 그러나 주로 약 15-85몰 퍼센트의 방향족 아민 성분과 약 15-85몰 퍼센트의 다른 디아민 성분을 함유하는 중합체로 사용된다. But it is mainly used as a polymer containing an aromatic amine component and the other diamine component of from about 15-85 mole percent of about 15-85 mole percent. (ａ) 선택된 이무수물과 방향족 디아민의 반응 혼합물을 혼합하고 적합한 용매에서 교반한다. (A) is mixed with the selected dianhydride and the aromatic diamine in the reaction mixture and stirred in a suitable solvent. (ｂ) 두 반응물의 반응은 환류 반응에서 물을 생성시킨다. (B) reaction of the two reactants produces water in a refluxing reaction. (ｃ) 환류 반응에 의하여 생성된 물을 증류에 의하여 제거한다. 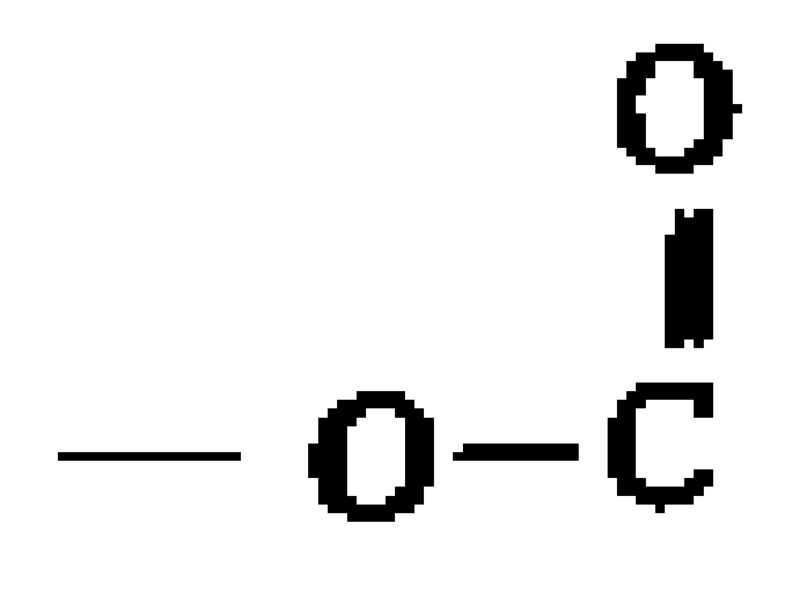 (C) is removed by the water produced by the refluxing reaction distillation. (ｄ) 물의 제거가 끝난후, 생성된 반응생성물 용액을 냉각시키고 적당한 방법, 예를들면 반응성물이 침전하도록 생성용액과 과량의 메탄올을 혼합하고 여과하여 중합체를 회수한다. And (d) after the removal of water, cooling the resulting reaction product solution, and mixing the resulting solution with an excess of methanol is a suitable method, for example, the reaction to precipitate hydrous product and filtered to recover the polymer. (ｅ) 침전된 중합체를 여과하여 분리시키고, 새로운 메탄올로 몇회 세척하고, 감압하에 약 60-80℃의 상승 온도에서 건조시켜서 메탄올과 부착용매를 휘발시킨다. (E) separation by filtration of the precipitated polymer and, by washing several times with fresh methanol, and at an elevated temperature of about 60-80 ℃ dried under reduced pressure to thereby evaporate the methanol solvent and adhesion. 폴리이미드가 일반식(ａ)의 방향족 디아민과 더불어 디아민 성분을 함유할 때, 폴리이미드는 원하는 성질과 반응물의 상호 화합에 의한 반응성에 다라 란덤 분자 배열, 블록-블록 분자 배열, 란덤 블록-란덤 분자 구조, 블록-란덤 분자 구조로 제조한다. Polyimide is to contain a diamine component with an aromatic diamine of formula (a), polyimide Dara randeom molecular arrangement on the reactivity of the cross-compound of the desired properties and the reaction product, a block-block molecular arrangement, randeom block-randeom molecule structure, block-randeom made of a molecular structure. 따라서, 먼저 이무수물 성분을 적합한 용매에서 방향족 디아민 성분과 반응시킨다. Thus, the first reaction and aromatic diamine component a dianhydride component in a suitable solvent. 성분은 단일 방향족 디아민 또는 이무수물이나 이들의 혼합물이 바람직하다. Component is preferably two days aromatic diamine or dianhydride or mixtures thereof. 반응이 끝난후, 생성된 물을 제거하고, 셋째 성분 아니면 다른 디아민, 다른 이무수물 또는 이의 혼합물을 반응생성 혼합물에 첨가하고 혼합물을 충분한 시간동안 고온까지 가열하여 폴리이미드의 중합체 용액을 제조하고 중합체를 전술한 방법 또는 다른 적합한 공지의 방법으로 회수한다. After the reaction was completed, remove the resulting water, third component, or another diamine, by the addition of another dianhydride or a mixture thereof to the reaction product mixture and heated to a high temperature for a sufficient period of time the mixture to prepare a polymer solution of the polyimide polymer It is recovered in the above-described method or other suitable known methods. 원하는 생성물이 폴리이미드산일 때, 디아민 성분 또는 이러한 성분의 조합물을 0℃까지 냉각시킨다. When the desired product polyimide sanil and cool the combination of diamine component or these components to 0 ℃. 이무수물 성분 또는 다른 성분들을, 온도를 약 0。-100℃, 바람직하기로는 약 20°-40℃로 유지하면서 장시간 점차적으로 가한다. Dianhydride of water component or other components, while maintaining the temperature at about 0.-100 ℃, preferably about 20 ° -40 ℃ and the prolonged gradually. 폴리아미드는 가열이나 촉매없이 이렇게 형성된 폴리아미드산 중합체를 환화시키므로서 폴리이미드로 쉽게 변환시킬 수 있다. Polyamide may be standing cyclization because the acid thus formed a polyamide polymer without heat or catalysts readily converted to the polyimide. 공지의 방법을 사용하여 환화시키므로서 단리된 폴리아미드산 또는 이의 용액을 폴리이미드로 효과적으로 변환시킬 수 있다. Because the cyclized using known methods standing isolated polyamide acids or solutions thereof can be effectively converted to a polyimide. 예를들면, 폴리아미드산의 환화는 약 150°250℃의 온도에서 폴리아미드산을 가열하므로서 효과적으로 할 수 있다. For example, cyclization of the polyamide acid may be effectively hameuroseo heating the polyamic acid at a temperature of about 150 ° 250 ℃. 또한, 본 발명의 폴리이미드는 용매없이 가열 용융 중합에 의하여 제조할 수 있다. In addition, the poly of the invention may be polyimide prepared by heating the melt-polymerized in the absence of a solvent. 재료들은 등분자량으로 간단하게 화합되는 혼합 및 가열된다. Materials are mixed and heated to be simply combined in equal parts jaryang. 이러한 방법중 하나는 약 300℃까지 가열된 추출기에서 재료를 화합하고 계속적으로 추출하면, 폴리이미드가 생성된다. One of these methods, if the compound material in the heated up to about 300 ℃ extractor and continuously extracted, the polyimide is produced. 생성된 중합체의 분자량을 조절하기 위하여는 반응 혼합물에 연쇄 정지제를 첨가하는 것이 바람직하다. In order to control the molecular weight of the resulting polymer it is preferred to add a chain stopper to the reaction mixture. 예를들면, 프탈 무수물 또는 아닐린을 약 1-5중량%의 양으로 사용하는 것이 바람직하다. For example, it is preferred to use phthalic anhydride or aniline in an amount of about 1-5% by weight. 폴리이미드의 경우에, 폴리(아미드-이미드)와 폴리(아미드-아미드산)을 제조하기 위한 일반식(ａ)의 방향족 디아민 성분과 산무수물 성분 반응은 적합한 용매에서 단계적으로 진행하는 것이 효과적이다. In the case of polyimide, poly (amide-imide) and poly (amide-amide acid), an aromatic diamine component and an anhydride component reaction represented by the general formula (a) for the preparation of the silver, it is effective to gradually proceed in a suitable solvent . 아미드-아미드산의 조합물은 디아민 성분을 삼산 무수물 성분과 간단하게 조합 및 혼합하므로서 일어난다. Amide-acid amide takes place hameuroseo combination of simply combining and mixing a diamine component and a dianhydride component trioxide. 아미드-이디드는 약 150°-250℃의 온도로 가열하여 환화시키므로서 형성된다. Amide-formed standing because heating by cyclization at a temperature of about 150 ° -250 ℃ lifting Edie. 또한 본 발명의 폴리(아미드-이미드)는 용매없이 재료를 등분자량으로 간단하게 조합하고, 혼합하고 가열하여서 하는 가열 융해 중합에 의하여 제조할 수 있다. In addition, the poly of the present invention may be (amide-imide) it will be produced by heating the fusion polymerization hayeoseo combination simply by uniformly jaryang the material in the absence of a solvent, and mixed and heated. 본 발명의 폴리이미드, 폴리(에스테르이미드)와 폴리(아미드-이미드)는 여러 가지 용도를 갖는다. Of the present invention, a polyimide, a poly (imide) and poly (amide-imide) it has a wide range of applications. 이들은 용융 가공성을 가지며 고온에서의 변형 또는 분해에 대한 내성과 구조강도를 각종 물품을 성형시키는데 사용할 수 있다. These can be used to have a melt processible molding a variety of articles the resistance and structural strength to deformation or degradation at high temperatures. 이들은 용해성, 고온에서의 특성과 전기적 성질이 우수하기 때문에, 이들은 특히 전기적 및 전자적 용도에 사용하는데 적합하다. Since these are excellent in properties and electrical properties in the solubility, a high temperature, it is particularly suitable for use in electrical and electronic applications. 본 발명의 중합체는 도선 에나멜과 같은 전자용으로 적합하고 전기 장치용 순응성 보호성, 접합성 및 부동성 피복제, 프린트 배성선판과 반도체 장치에 사용하는데 적합하다. The polymers of the present invention are suitable for use in electronics, such as the enamel wire and is suitable for use in the compliant protective dynamoelectric property, bonding properties, and free-floating coatings, printing isostery seonpan and the semiconductor device. 중합체는 쉽게 사용할 수 있고 경화시킬 수 있다. The polymer may be easily used and cured. 이들은 사용시 붕과되지 않고 이를 사용하는 장치의 전기적 특성을 보강해 준다. These are not in use and boron makes it reinforces the electrical properties of the device using it. 중합체는 이를 사용한 표면에 매우 강하게 접착하고 장치 표면에서 이온의 이동을 막아준다. Polymer is very strongly bonded to the surface using the same, and prevents the movement of ions from the device surface. 반도체 장치에 사용했을 때, 이들은 건조 순환하는 동안 장치의 조작특성에 해를 주는 어떠한 물질을 방출하지는 않는다. When used in semiconductor devices, it does not release any substances which harm the operation characteristics of the device during the drying cycle. 또한 중합체는 다층으로 사용할 수 있으므로 필요에 따라 피막 두께를 공급할 수 있고 그 자체는 물론 여러 가지 금속 및 비금속 기질에 잘 접착시킬 수 있다. In addition, polymers may be used in multiple layers and to supply the film thickness as required by itself as well as can be well adhered to a variety of metallic and non-metallic substrates. 폴리이미드, 폴리(에스테르이미드)와 폴리(아미드-이미드)는 반투명이고, 이러한 물질은, 다른 원하는 특성을 보유하므로 광기전장치를 구성하는데 유용하다. Polyimides, poly (imide) and a poly-a (amide-imide) is semi-transparent, such materials, since the pictures of other desired properties it is useful to construct the photovoltaic device. 이들은 광 방출 다이오우드의 조작에 따라 장치 “ｏｎ”과“ｏｆｆ”를 전환시키기 위하여 반도체 장치의 표면에 광출 다이오우드를 접착시키는데 접합하다. These are bonded sikineunde gwangchul bonding a diode to the surface of the semiconductor device so as to switch the device "on" and "off" in response to the operation of the light emitting diode. 본 발명의 공중합체 재료 태양 전지와 같은 광기전기의 노출된 표면에 보호막을 접착시키는데 사용하면 바람직하다. When used to bond the protective film to the exposed surface of the photovoltaic electricity, such as a copolymer material solar cell of the present invention it is preferred. 폴리이미드, 폴리(에스테르이미드)또는 폴리(아미드-이미드)의 절연 내력은 이에 적합한 충전제를 혼합하므로서 더 보강된다. Polyimides, poly (imide) or poly-dielectric strength of the (amide-imide) is hameuroseo mixing thereto suitable filler is further reinforced. 바람직하기로는, 중합체와 거의 동일한 절연 상수를 갖는 전기적 절연 재료를 이에 혼합하는 것이다. Preferably, to mix the electrical insulating material having substantially the same dielectric constant and the polymer thereto. 충전제는 기질에 사용 피복제에 균일하게 분산시킨다. The filler is uniformly dispersed in the matrix used in the coating agent. 충전제로서 적합한 다른 물질은 절연 항수가 중합체보다 더 높으므로 전기 전도의 저항이 비교적 양호한 성질을 갖는 공지의 물질이 있다. Other materials suitable as filler is isolated wherein the number greater than the polymer, so there is the known resistance of the electrically conductive material having relatively good properties. 전기 절연 충전제는 정묘하게 분쇄된 미분된 미분말 형태의 산화 알루미늄, 산화 실리콘, 유리 섬유, 질화 붕소,석영 운모, 활성 폴리테트라플루오르에틸렌등이 적합하다. Electrical insulating filler is a finely divided jeongmyo pulverized fine powder in the form of aluminum oxide, silicon oxide, glass fibers, boron nitride, quartz, mica, and the active polytetrafluoroethylene is preferable. 충전 또는 비충전된 폴리이미드, 폴리(에스테르이미드) 또는 폴리(아미드-이미드)를 사용하면, 주어진 장치의 전기성은 향상된다. The filled or unfilled polyimides, poly (imide) or poly-Use (amide-imide), and is improved in a given electrical device. 폴리이미드, 폴리(에스테르이미드) 또는 폴리(아미드-이미드)는 약 -100℃의 온도에서 액체 가스에 침지시켜 약 200℃ 이상의 온도의 액체 가스로 역류시키는 반복순환에 견디는 고유탄성을 갖는다. Polyimides, poly (imide) or poly (amide-imide) has an inherent elasticity to withstand repeated cycling to reflux at a temperature of about -100 ℃ with liquid gas in the temperature of at least about 200 ℃ was immersed in the liquid gas. 더우기 물리이드는 이들의 전기적 특성에는 손실이 없이 약 350°-550℃의 짧은 온도에 견디는 것을 알 수 있다. Moreover, it can be seen that the physical Id withstand short temperature of about 350 ° -550 ℃ is no loss of electrical properties thereof. 폴리이미드, 폴리(에스테르이미드) 또는 폴리(아미드-이미드)는 산화 규소, 질화 규소, 질화 알루미늄등의 전기적 절연층상에 사용할 수 있고 ; Polyimides, poly (imide) or poly (amide-imide) can be used for electrically insulating layer such as silicon oxide, silicon nitride, aluminum nitride; 또한 이는 이들 물질 자체를 절연층으로 사용할 수 있다. It also can be used such materials as the insulating layer itself. 실제적으로 불활성이고, 온도 내성을 갖고, 가열로 유동할 수 있고 우수한 절연성을 갖는 열가소성 폴리이미드는 예를들어 부동 피복제로서 사용할 수 있다. A substantially inert, have a temperature tolerance, can be allowed to flow for a heating furnace, and a thermoplastic polyester having an excellent insulating property Example polyimide floating used as coating agent. 폴리이미드를 장치에 사용한다. It uses the polyimide to the device. 다음, 폴리이미드에 구멍을 만들고, 철선을 장치에 부착시키고 ; Then making a hole in a polyimide, and a wire attached to the device; 폴리이미드를 유동시켜 철선 주위의 틈을 메운다. To flow the polyimide fills a gap around the wire. 따라서 자체 표면을 고르게 안정화시킨 피막을 제공한다. Therefore provides a film which uniformly stabilize its surface. 폴리이미드, 폴리(에스테르이미드) 또는 폴리(아미드-이미드)는 접착성과 절연성을 가지기 때문에, 이들을 사용하여 둘 또는 그 이상 층의 칩을 결합시켜 다층 반도체 장치를 제공한다. Polyimides, poly (imide) or poly (amide-imide) is due to its adhesive and insulating properties, by combining two or chip or more layers using them provide a multi-layer semiconductor device. 본 발명의 열가소성 폴리이미드, 폴리(에스테르이미드)와 폴리(아미드-이미드)는 추출, 압출 및 분사성형, 필름 캐스팅 및 용액 섬유 방사 기술에 의하여 가공할 수 있다. Of the present invention, a thermoplastic polyimide, poly (imide) and poly (amide-imide) can be processed by the extraction, extrusion and injection molding, film casting and solution fiber spinning techniques. 이들은 높은 연신율과 인성을 가지기 때문에, 특히 필름, 에나멜, 접착제, 피복제 및 섬유질과 같은 엷은 필름 제품에 유용하다. Because it has a high elongation and toughness, especially useful for thin film applications such as films, enamels, adhesives, coatings and fibers. 더욱이, 폴리이미드는 200℃에서 높은 강도를 보유하고 부분으로 성형할 수 있고 예를들면, 흑연과 유리-섬유 박층을 제조하는 동안 짧은 기간에 250℃로 톺일 수 있다. Furthermore, the poly can already have the high lifting strength at 200 ℃ and molded into a part, for example, graphite and glass - can topil to 250 ℃ in a short time during manufacture of the fiber a thin layer. 중합체는 전산과 같은 기질상에 튜브등으로 추출될 수 있고 다른 중합체와 함께 추출하여 층 사이에서 양호한 접착성을 나타내는 다층 튜브 또는 절연 철선을 제조하므로서 고온 및 전기적 성질을 개량시킨다. The polymer thereby improving the high temperature and electrical properties to be extracted by the tube or the like onto a substrate such jeonsangwa and extracted with another polymer hameuroseo provide a multilayer tube or wire insulation exhibits good adhesion between the layers. 반응 생성물이 가공 온도에서는 형성되지 않기 때문에, 박층,필름과 파막에 약간의 틈이나 결점이 나타난다. Since the reaction product is not formed in the working temperature, when a slight gap or defect in the thin film and pamak. 이들의 연신성은 낮은 담약성을 양호한 기계성을 나타낸다 ; Their elongation castle represents a lower wall yakseong good mechanical property; 폴리이미드, 폴리(에스테르이미드)와 폴리(아미드-이미드)는 우수한 고온성을 나타내므로 후경화는 필요없다 ; Polyimides, poly (imide) and poly (amide-imide) is the post cure is not required because it represents superior thermophilic; 이들은 필요에 따라 사용할 수 있다 ; They may be used if necessary; 이들은 통상의 캐스팅기를 사용하여 용액으로부터 필름을 캐스트 할 수 있고, 이 필름은 지지용 및 비지지용으로 사용된다 ; They are using a conventional casting of the film can be cast from a solution, this film is used as a support for the resin and the busy; 필름은 그 자체는 물론 다른 폴리(에스테르이미드) 또는 폴리(아미드-이미드)에 열 접착시키므로서 잘 접착된다 ; The film itself, as well as other poly (imide) or poly (amide-imide) thermal bonding because standing is well adhered to; 이들은 섬유로 용액-방사하여 방염성, 고온 내성을 갖는 직물을 제조할 수 있다. These fibers in solution - can be prepared by spinning a fabric having flame-resistant, high temperature resistant. 이들은 각종 충전제와 고온에서 함께 고온에서 높은 강도를 갖고 방염성을 갖는 부품으로 성형할 수 있다 ; It has a high strength at a high temperature with a high temperature in a variety of fillers and can be molded into parts having a flame retardancy; 비충전된 성형 부품은 열 팽창 계수가 낮은 반면에 유리, 흑연, 및 석면으로 충전된 부품은 열 팽창계수가 더 낮다 ; Unfilled molded parts, the part filled with glass, graphite, asbestos, and on the other hand a low coefficient of thermal expansion is a coefficient of thermal expansion is lower; 이들은 마찰을 낮게 하므로 내구성을 갖는 부품을 제공하고 혹연 분말, 이황화몰리부덴 또는 텅그스텐 또는 ＰＴＦＥ로 충전된 성형 화합뮬은 피스톤 링, 밸브 시이트, 베어링, 쌀과 드로스트 왓샤와 같은 자체 윤활 피복면을 부품을 제공한다. These are low because it provides a device having a durable and hokyeon powder, disulfide Molly molded unity mule filled with buden or teonggeu stainless steel or PTFE friction is a self-lubricating coating surfaces such as piston rings, valve seats, bearings, rice and de roast watsya It provides components. 박층은 고압 프레스, 진공 배그 또는 상압 진공 오토크레이브 배그에서 만든다. Thin layer is made in a high pressure press, a vacuum or atmospheric pressure vacuum autoclave baegeu baegeu. 용액은 라미네이팅와니스로 사용하여 유리, 흑연, 석영 또는 유사 직물이나 유리, 붕소, 흑연, ＡＲＡＭＩＤ 또는 유사 섬유 섬유를 함침시켜서 레이도움, 프렌트 배선판, 방사성 폐기물 용기, 터어빈 깃과 가열된 엔진 주변에 말착하여 사용하는 구조물 부품에 유용한 방염성, 고온강도 및 양호한 전기적 성질을 갖는 박층을 제조한다. Solution was laminated using a varnish glass, graphite, quartz or the like by textile or glass, boron, impregnated graphite, ARAMID or the like fibers ray help, program, rental circuit boards, radioactive waste containers, turbine malchak to the engine around the heating and feathers to prepare a useful part in the structure using flame-resistant, thin layer with a high-temperature strength and good electrical properties. 폴리이미드 필름은 액체 헬륨 온도에서 450℃까지에서 양호한 기계적 성질을 갖는다. Polyimide film has good mechanical properties at up to 450 ℃ at liquid helium temperature. 이는 높은 인장력을 가지고 강도와 인열 개시에 대한 높은 내성을 나타낸다. This indicates a high resistance to tear initiation strength and has a high tensile force. 실론에서 성질은 폴리에스테르의 호오스와 비슷하며 200℃에서 필름은 파손없이 1/4인치 맨드릴에서 굽어지며 250℃에서 이는 3500-4000psi의 인장 강도를 갖는다. In Ceylon properties are similar to the hose of the polyester, and becomes curved in a 4-inch mandrel without damage to the film at 200 ℃ has a tensile strength of which in 250 ℃ 3500-4000psi. 전술한 명세서에서는 여러 가지 분자 배열과 폴리이미드, 폴리(에스테르이미드)와 폴리아미드산의 용도를 서술했다. In the foregoing specification it has described a variety of molecular arrangement as polyimide, poly (imide) and the use of a polyamic acid. 본 발명을 실시예를 들어 설명하면 다음과 같고, 여기서 모든 부와 퍼센트는 다른 언급이 없는 한중량을 나타낸다. When describing the present invention with reference to examples as follows, all parts and percentages herein represents the amount of Korea and China, unless otherwise noted. 교반기, 응측기, 딘 스타크 트랩, 온도계, 열표시기, 가열용 맨틀이 장치된 250ｍｌ의 3지 플라스크에 3.44그람(0.01몰)의 1,4-비스(ｐ-아미노쿠밀)벤젠을 질소 가스하에 50ｇ의 Ｎ-메틸 피롤리돈(ＮＭＰ)과 함께 충전한다. 50g a stirrer, a condenser, a Dean-Stark trap, a thermometer, 1,4-bis (p- amino-cumyl) of 3.44 grams (0.01 mol) of a thermal indicator, 3 support a 250ml flask, heating mantle apparatus for benzene under nitrogen gas of N- methylpyrrolidone is filled with pyrrolidone (NMP). 혼합물을 용액이 투명해질 때까지 교반한 다음, 5.10ｇ(0.01몰)의 4,4'-비스(3,4-디카르복시펜옥시)디페닐 설파이드 이무수물을 질소 가스하에 77.10ｇ의 Ｎ-메틸 피롤리돈과 함께 플라스크에 넣는다. The mixture was stirred until the solution is clear, and then, 5.10g 4,4'- bis (0.01 mol) of (3,4-dicarboxy phenoxy) diphenyl sulfide N- methyl 77.10g of a dianhydride in a nitrogen gas blood is placed in a flask with pyrrolidone. 또한 플라스크에 0.01ｇ의 ｐ-톨루엔 설폰산(촉매)를 채운다. Also it fills the p- toluene sulfonic acid (catalyst), 0.01g of the flask. 반응 혼합물을 투명 용액을 얻을 때까지 교반하고 환류 온도에 도달할 때까지 가열을 한다. Stirring until the reaction mixture to get a clear solution and the heat until it reaches the reflux temperature. 반응 혼합물을 한시간동안 화류온도에서 유지한, 다음, 이시간에, 약 50ｇ의 ＮＭＰ를 축합반응으로 형성된 물과 증류제거한다. Hwaryu was kept at this temperature for the reaction mixture one hour, and then removed at this time, condensed water and about 50g of NMP distillation formed by the reaction. 반응물의 온도를 감소시킨 다음 약 4시간동안 195°-198℃로 조절한다. Reducing the temperature of the reaction for about 4 hours and then adjusted to 195 ° -198 ℃. 끈후 가열을 중지하고 반응물을 50℃로 냉각시킨다. Kkeunhu to stop the heating and cooling the reaction to 50 ℃. 중합체를 메탄올에 부어 침전시켜서 투명한 중합체 용액을 얻는다. Pour the polymer precipitated in methanol, thereby to obtain a transparent polymer solution. 준합체를 새로운 메탄올로 세척한 후 48시가동안 상온에서 건조한다. After washing the copolymer gave a new methanol for 48 cigar is dried at room temperature. 폴리이미드 중합체를 Ｎ-메틸 피롤리돈에 용해시키면 10%의 투명 고용체를 얻는다. When dissolving the polyimide polymer in N- methylpyrrolidone to obtain a transparent solid solution of 10%. 테플론 이형제로 처리된 유리판에서 필름을 캐스트하고 0-300℃의 온도를 갖는 오븐에서 건조시키면, 유연성의 맑은 암갈색의 필름을 얻는다. When the cast film in a teflon mold release agent treated glass plate and dried in an oven having a temperature of 0-300 ℃, to obtain a clear dark brown of the flexible film. 폴리이미드 수지의 유리전이온도는 분별 스캔닝 비색법으로 측정하면 215℃이었다. The glass transition temperature of the polyimide resin was measured as 215 ℃ fractionation scanning colorimetry. 실시예 1의 장치와 방법을 사용하여, 3,44ｇ(0.01몰)의 1,4-비스(ｐ-아미노쿠밀)벤젠을 3.2525ｇ(0.01몰)의 3,3'4,4'벤조페논 테트라카르복실 이무수물과 반응시킨다. In Example 1 by use of the apparatus and method, 3,44g (0.01 mol) of 1,4-bis (p- amino-cumyl) 3,3'4,4 'benzophenonetetracarboxylic of benzene 3.2525g (0.01 mol) carboxylic dianhydride and thereby reaction. 반응 혼합물로부터 투명의 중합 생성물을 회수한다. And from the reaction mixture and recovering the polymerization product of a transparency. ＮＭＰ에 폴리이미드를 용해시킨 10중량%의 용액을 제조하고 이를 선처리된 유리판에서 캐스트 한 다음 0°-300℃ 온도의 오븐에서 건조시키면, 유연성의 맑은 암갈색 필름을 얻고, 이를 분별 스캔닝 비색법으로 측정하면 유리전이온도는 257℃이었다. Preparing a solution of 10% by weight of the polyimide was dissolved in NMP, and a cast in the pre-processing it, and then the glass plate was dried at 0 ° -300 ℃ when the temperature oven, to obtain a clear dark brown film having a flexibility, measured by this fractional scanning colorimetry When the glass transition temperature was 257 ℃. 교반기, 응축기, 딘 스타크, 트랩, 온도계, 가열용 맨틀과 질소 블랭킷이 장치된 1000ｍｌ의 3지 플라스크에 질소 가스하여 17.2ｇ(0.05몰)의 1,4-비스(ｐ-아미노쿠밀)벤젠과 300ｇ의 Ｎ-메틸 피롤리돈을 충전하고, 혼합물을 투명 용액이 될 때까지 교반한 다음, 300ｇ의 ＮＭＰ에서의 32.525ｇ(0.1몰)의 3,3',4,4',-벤조페논 테트라카르복실 이무수물과 150.925ｇ의 ＮＭＰ에서의 22.5ｇ(0.05몰)의 4,4'-설폰일비스 (ｐ-페닐렌옥시)디아닐린과 0.1ｇ의 ｐ-톨루엔 설폰산을 질산 가스하여 반응기에 채운다. 1,4-bis (p- amino-cumyl) of a stirrer, a condenser, a Dean-Stark, a trap, a thermometer, a nitrogen in the third flask, not the heating mantle and nitrogen blanket for device 1000ml gas to 17.2g (0.05 mole) of benzene and 300g of N- methylpyrrolidone were charged to money, and stirred until the mixture become a clear solution, and then 3,3 ', 4,4' of 32.525g (0.1 mol) in 300g of NMP, - benzophenone tetracarboxylic acid dianhydride and 4,4 of 22.5g (0.05 mol) in NMP 150.925g of sulfonyl-bis (p- phenylene-oxy) aniline and D to the nitric acid p- toluene sulfonic acid 0.1g of gas filled in the reactor . 반응 혼합물을 교반하면서 화류 온도에 도달할 때까지 일정한 속도로 가열한다. While stirring the reaction mixture is heated at a constant rate until it reaches a temperature hwaryu. 반응 혼합물을 1시간동안 화류 온도에서 유지하고 이때 축합반응에서 형성된 물과 110ｇ의 ＮＭＰ를 증류제거하고 반응 혼합물을 195-198℃의 온도에서 4시간동안 유지한 후 가열을 중지하고 온도를 100℃까지 내린다. The reaction mixture was held at temperature for 1 hour hwaryu and wherein the evaporation of the water and 110g of NMP formed in the condensation reaction, and the reaction mixture to stop the heating and kept at a temperature of 195-198 ℃ for 4 hours and heated to 100 ℃ down. 투명 중합 반응 혼합물을 여과한 다음 메탄올에 붓고 여기서 폴리이미드 중합체를 침전시킨다. Filtering the transparent polymerization reaction mixture was poured into methanol, and then, where the polyimide polymer precipitated. 중합체를 메탄올로 세척한 다음 48시강동안 공기로 건조시킨다. And dried in air for washing the polymer with methanol, and then 48 sigang. 폴리이미드를 ＮＭＰ에 용해시키면 10중량%의 투명 공용체를 얻으며 테플론 이형제로 처리된 유리판에서 필름을 캐스트한다. When dissolving the polyimide in NMP obtains the union of a transparent 10% by weight and cast the film in a glass teflon release agent treatment. 수지 피복 유리를 90℃에서 45분간, 150℃에서 20분간, 200℃에서 20분간, 300℃에서 15분간 건조한 다음, 유연성의 맑은 암갈색 필름을 얻게 된다. The resin-coated glass dried at 90 ℃ 45 minutes, and 20 minutes at 150 ℃, for 20 minutes at 200 ℃, 15 minutes at 300 ℃ is obtained and then, a clear dark brown film having a flexibility. 폴리이미드를 분별 스캔닝 비색법으로 유리전이온도를 측정하면 270℃이었다. When the glass transition temperature measured by scanning colorimetry discern the polyimide was 270 ℃. 실시예 1의 장치와 방법을 사용하여, 1,72ｇ(0.005몰)의 1,4-비스-(ｐ-아미노쿠밀)벤젠을 5.1ｇ(0.01몰)의 비스[4,4'-디(3,4-디카르복실펜옥시)페닐]설파이드 이무수물과 2.25ｇ(0.005몰)의 4,4'-비스(ｐ-아미노펜옥시)디페닐설폰과 반응시킨다. Performed using the apparatus and method of Example 1, 4-bis of 1,72g (0.005 mol) of bis (p- amino-cumyl) benzene to 5.1g (0.01 mole) of 4,4'-di (3 , 4-dicarboxylic phenoxy) phenyl] sulfide, 4,4'-bis (p- acetaminophen of dianhydride and 2.25g (0.005 mol) oxy) is reacted with di-sulfone. 얻은 투명의 중합체 용액을 메탄올에 부여 중합체를 침전시키고 중합체를 새로운 메탄올로 세척한 다음 상온에서 48시간동안 건조시킨다. A precipitate the polymer to give a polymer solution of the obtained transparent polymer in methanol and washed with methanol then a new dried at room temperature for 48 hours. 생성된 폴리이미드 중합체를 ＮＭＰ에 용해시킨 10중량%의 용액을 제조하고 이를 선처리된 유리판에서 캐스트한 다음, 0-300℃의 온도에서 건조하면 유연성을 갖고 열가소성인 맑은 암갈색 필름을 얻으며 이를 분별 스캔닝 비색법(Ｄ.Ｓ.Ｃ)으로 유리전이 온도를 측정하면 213℃이었다. Preparing a solution in which 10 wt% of dissolved and the resulting polyimide polymer in NMP, and a cast in the pre-processing it, and then the glass sheet, when dried at a temperature of 0-300 ℃ discern them have flexibility obtain a thermoplastic of a clear dark brown film scanning When the glass transition temperature measured by colorimetric method (D.S.C) was 213 ℃. 실시에 1의 장치와 방법을 사용하며, 실시예 5-10은 표에 열거된 이무수물과 디아민으로 행한다. The embodiment uses an apparatus and method for 1, Examples 5-10 are carried out with the dianhydride and the diamine listed in the table. 얻은 각 열가소성 중합체의 유리전이온도를 다음표에 표시했다. A glass transition temperature of the respective thermoplastic polymer obtained was shown in the following table. 교반기, 응축기, Ｙ-관, 분발 첨가 펀낼, 온도계, 드라이 아이스-아세톤 냉각조와 질소 블랭킷이 장치된 1000의 4가지 플라스크에 17.2ｇ(0.05몰)의 1,4-비스(ｐ-아미노쿠밀)벤젠과 시약 디메틸 아세트아미드(ＤＭＡＣ)를 질소 가스하에 충전한다. Stirrer, condenser, Y- tube, appearance peonnael addition, a thermometer and a dry ice-acetone cooling tank and 1,4-bis (p- amino-cumyl) of 17.2g (0.05 mol) of the four flasks a nitrogen blanket The device 1000 benzene and reagent dimethyl charges acetamide (DMAC) in a nitrogen gas. 교반후 냉각하여 온도를 약 -10℃로 내리고, 5,26ｇ(0.025몰)의 트리멜리트 무수물 일산 염화물을 약 20분간 채우고 질소 가스하여 교반을 계속하고 온도를 -5℃ 이하로 유지한다. After stirring and cooling down to a temperature of about -10 ℃, to fill the trimellitic anhydride chloride monoxide of 5,26g (0.025 mol) for about 20 minutes. Stirring was continued with a nitrogen gas and maintaining the temperature below -5 ℃. 5.26ｇ(0.025몰)의 트리멜리트 무수물 일산 염화물을 약 40분가 충전하고 질소 가스하에 약 -5℃에서 교반을 계속한다. The trimellitic anhydride chloride monoxide of 5.26g (0.025 mol) filled about 40 branch family and stirring was continued at about -5 ℃ under nitrogen gas. 다음 0°-5℃의 온도에서 5.5ｇ(0.05몰)의 트리에틸아민을 질소 가스하에 약 20분간 적가하고 교반을 계속한다. For about 20 minutes and then added dropwise to triethyl of 5.5g (0.05 mol) of the amine at a temperature of 0 ° -5 ℃ under nitrogen gas and stirring was continued. 다음 35.5ｇ의 시약 ＤＭＡＣ를 질소하에 충전하고 반응물을 3시간동안 약 15℃에서 교반한다. Charging a reagent, and then 35.5g of DMAC under nitrogen and stir the reaction at about 15 ℃ for 3 hours. 18.9ｇ의 피리단과 27.1ｇ의 시약 산 무수물을 질소 가스하에 충전한 다음 반응물을 실온에서 12시간동안 교반한다. An anhydride reagent of the flutes end 18.9g 27.1g and stirred at room temperature for 12 hours and then the reaction was charged under nitrogen gas. 반응물을 여과한 다음 피리딘 염화수소산염을 제거한 후 여과물을 물에 부으면 불리아미드-이미드 중합체가 첨전된다. The reaction was filtered, and then remove the pyridine hydrogen chloride salt pour the filtrate into water disadvantage -amide are already cheomjeon DE polymer. 이 중합체를 충분한 양의 새로운 물로 세척하고 혼합기에서 미세분말로 분쇄한다. Washing the polymer a sufficient amount of fresh water in a mixer and pulverized to a fine powder. 다음 건조된 중합체를 60℃ 및 300ｍｍＨｇ 압력의 진공 오븐에서 2시간동안 경화시킨 후 유리병에 넣는다. And then cured for 2 hours and the dried polymer in a vacuum oven at 60 ℃ and 300mmHg and then placed in a pressure vial. 여기서 얻은 10ｇ의 중합체를 30ｇ의 ＮＭＰ에 용해시킨면 투명 용액을 얻는다. That face dissolving 10g of polymer obtained here in 30g of NMP to obtain a clear solution. 이 용액으로 처리된 유리판에서 필름을 캐스트하 다음 표준 경화 스케줄을 사용하여 강제 공기 오븐에서 경화시킨다. To the film in a glass plate treated with the solution using a standard cast and then cured in a forced air oven to cure schedule. 맑은 황색 열가 소정 필름을 얻고 이를 열역확적 비색법으로 측정하면 유리전이온도는 183℃이었다. If you obtain a clear yellow thermoplastic predetermined film to measure this yeolyeok hwakjeok colorimetric method and the glass transition temperature was 183 ℃. 13.7ｇ(0.04몰)의 1,4-비스(ｐ-아미노쿠밀)벤젠을 8.422(0.04몰)의 트리멜리트 무수물 일산 염화물과 18.0(0.04몰)의 4,4'-설파닐-비스(ｐ-페닐렌옥시)디아닐린과 함께 반응시킨 다음, 나머지 8.42ｇ(0.04몰)의 트리멜리트 무수물 일산 염화물을 실시예 11에 서술된 것과 동일한 방법으로 첨가하는 것을 제외하고, 실시예 11을 반복한다. 13.7g (0.04 mol) of 1,4-bis (p- amino-cumyl) 4,4 sulfamic of benzene 8.422 (0.04 mol) of trimellitic anhydride chloride monoxide and 18.0 (0.04 mole) of the carbonyl-bis (p -phenylene-oxy) was reacted with di-aniline and then, except that as the trimellitic anhydride chloride Ilsan the remaining 8.42g (0.04 mol), described in example 11 was added in the same way, and repeating example 11 . 8.89ｇ(0.08몰)의 트리에틸아민을 30.22ｇ의 피리단과 43.34ｇ의 시약 초산 무산물과 반응시킨다. 8.89g (0.08 mol) triethylamine and 30.22g of a fluted end of the reagent acetic collapsed 43.34g of water and thereby the reaction. 실시예 11에 서술된 것과 동일한 방법으로 중합체를 만든 후, 회색 열가소성 중합체 필름을 얻는다. Carried out after the polymer made in the same manner as described in Example 11, to obtain a gray thermoplastic polymer film. 이 중합체는 우수한 접착성을 나타낸다. This polymer shows excellent adhesion. 실시예 1의 장치와 방법을 사용하여, 10.32ｇ(0.03몰)의 1,4-비스(ｐ-아미노쿠밀)벤제을 19.2ｇ(0.03몰)의 2,2-비스(트리멜리트 옥시페닐)프로판 이무수물과 반응시키면, 반응혼합물로부터 투명의 중합체 생성물을 얻는다. Example 1 Using the apparatus and method, 2,2-bis (trimellitic oxyphenyl) of 1,4-bis (p- amino-cumyl) Ben jeeul 19.2g (0.03 mol) of 10.32g (0.03 mol) when propane dianhydride and reaction, from the reaction mixture to obtain a polymer product of a transparency. 샐성된 폴리(에스테르이미드) 준합체를 ＮＭＰ에 용해시킨 10중량%의 용액을 제조한 다음 이를 처리된 유리판에서 캐스트한 다음 0°-300℃의 온도의 오븐에서 건조시킨다. Prepare a solution containing 10 wt% of dissolved saelseong the poly (imide) copolymer in NMP gave thereby following a cast process it in a glass plate and then dried in an oven at a temperature of 0 ° -300 ℃. 유연성의 맑은 암갈색 필름을 얻는데 이를 Ｄ.Ｓ.Ｃ 로 측정하면 유리전이온도는 200℃이었다. To obtain a clear dark brown film having a flexibility when measured D.S.C it to the glass transition temperature was 200 ℃. 1,4-비스(ｐ-아미노쿠밀)벤젠의 양을, 반을 제거하여 6.75ｇ(0.015몰)의 4,4'-설폰일비스(ｐ-페닐렌옥시)-디아닐린으로 대치하는 것을 제외하고, 실시예 13을 반복하면, 반응 혼합물로부터 투명의 중합체 생성물을 얻는다. To the amount of 1,4-bis (p- amino-cumyl) benzene, removing the semi-4,4'-sulfonyl-bis (p- phenylene-oxy) of 6.75g (0.015 mol), except for replacing the dianiline and, repeating the example 13 to obtain a polymer product from the reaction mixture in a transparent. 생성된 공중합(에스테르이미드)중합체를 ＮＭＰ에 용해시킨 10중량％의 용액을 제조한 다음 이를 처리된 유리판에서 캐스트하고 0°-300℃의 오븐에서 건조시키면, 유연성의 맑은 암갈색 필름을 얻으며 이의 유리전이온도는 205℃이었다. Prepare a solution of which 10% by weight to dissolve the resulting copolymer (imide) polymer in NMP, and then when cast on a glass plate and dried to process them in an oven at 0 ° -300 ℃, obtain a clear dark brown film having a flexibility thereof, the glass transition the temperature was 205 ℃. 높은 토오크 교반기 탭 물 냉각조, 온도기와 질소 블랭킷으로 장치된 500ｍｌ의 3지 플라스크에 34.4ｇ(0.1몰)의 1,4-비스(ｐ-아미노쿠밀)벤젠을 질소가스하에 103.2ｇ의 ＮＭＰ와 충전하고, 투명 용액을 얻을 때까지 교반을 계속한 다음, 냉각시켜 전체 조작시의 온도가 20-35℃에서 유지되도록 한다. High torque stirrer tap water cooling bath, the temperature group 1,4-bis (p- amino-cumyl) benzene and the charge of 103.2g of NMP under a nitrogen gas of 34.4g (0.1 mol) of 3 if the device 500ml flask with nitrogen blanket continuing the stirring until and obtain a clear solution and then cooled so that the temperature during the entire operation maintained at 20-35 ℃. 냉각된 용액에 32.59ｇ의 3,3',4,4'-벤조페논 테트라카르복실 이무수물을 97.8ｇ의ＮＭＰ와 함께 예정 부분에 충전하여 질소가스하에 주어진 시간에 25％ 고체 농도를 유지하도록 하고, 일정한 속도로 교반을 계속한다. By filling a 32.59g of 3,3 ', 4,4'-benzophenone tetracarboxylic dianhydride in the cooled solution on a scheduled portion with 97.8g of NMP, and to maintain a 25% solids concentration at any given time, under a nitrogen gas and stirring was continued at a constant rate. 첨가를 35분에 끝낸후 반응물을 16시간동안 실온에서 교반하여 반응을 완성시킨다. After completion of the addition 35 minutes the reaction is completed the reaction mixture was stirred at room temperature for 16 hours. 다음, 생성된 폴리아미드산을 질소 가스하에 압착여과하고 0-5℃의 폴리프로필렌 병에 저장한다. Next, press filtration and the resulting polyamic acid in a nitrogen gas and stored in a polypropylene bottle for 0-5 ℃. 여기서 열가소성, 유연성의 황색 폴리이미드를 얻는데 이의 유리전이온도는 275℃이었다. The thermoplastic, yellow polyimide to obtain its glass transition temperature flexibility was 275 ℃. 4-비스(ｐ-아미노쿠밀)벤젠의 반을 22.5ｇ의 4,4'-설페닐비스(ｐ－페닐렌옥시)디아닐린으로 대치하는 것을 제외하고, 실시예 15의 방법을 반복한다. 4-bis (p- amino-cumyl) except that it replaces the half of the benzene sulfonic 4,4'-phenyl-bis (p- phenylene-oxy) 22.5g of di-aniline, and repeats the method of example 15. 동일한 방법으로 실시하면, 공중합이미드 중합체 필름이 생성되고 이는 Ｄ．Ｍ．Ｃ.에 의하여 유리전이온도를 273℃를 나타냈다. 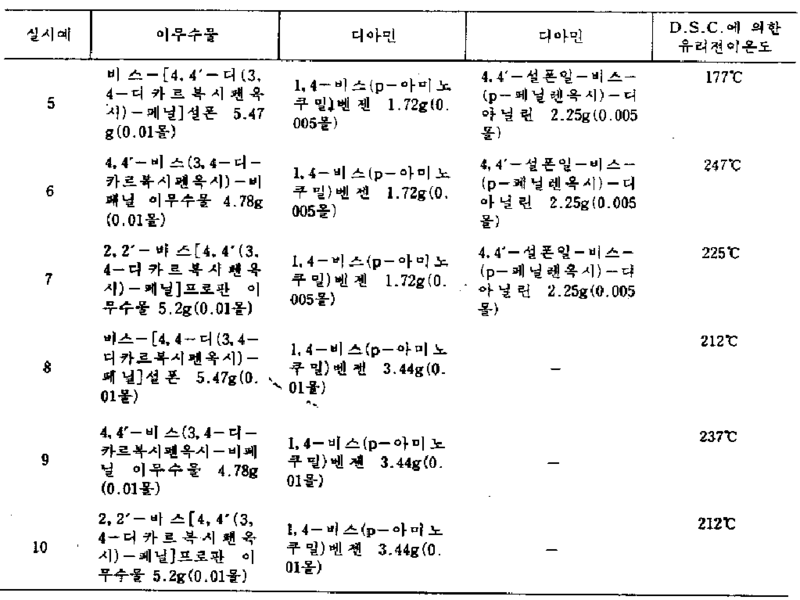 When carried out in the same manner, copolymerizable imide polymer film is produced, which exhibited a glass transition temperature 273 ℃ by D.M.C..
(ｂ) 방향족 디아민의 반응생성물을 15-85몰 퍼센트를 함유하는 열가소성 폴리이미드, 폴리(아미드-이미드), 폴리(에스테르이미드) 또는 폴리아미드산의 제조방법. 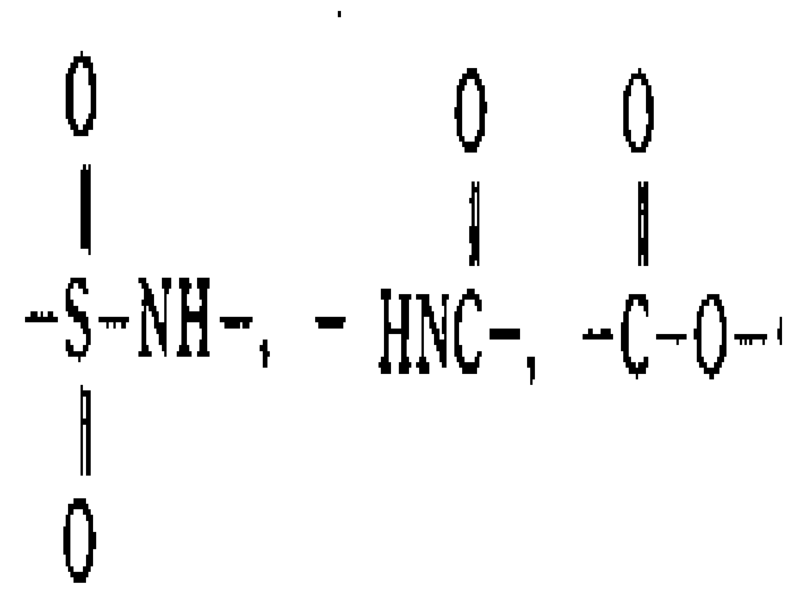 (B) the reaction product of an aromatic diamine thermoplastic polyimide containing 15-85 mole percent, poly (amide-imide) The process for producing a poly (imide) or a polyamic acid. 제1항에 있어서, 다음 일반식의 반복구조단위하는 함유하는 중합체를 형성시킴을 특징으로 하는 제조방법. The method of claim 1, wherein the production method characterized by the following Sikkim form a polymer containing a repeating structural unit represented by the general formula. 상기 식에서 Ｋ와 Ｋ'는 중합체에서 중합체 블록수를 나타내는 양의 정수이고, ｒ과 ｒ'는 중합체 사슬에서 반복수를 나타내는 1이상의 같거나 다른 정수를 나타낸다. 'And it is a positive integer representing the number of polymer blocks in the polymer, r and r' wherein K and K is equal to or more representing the number of repeating in the polymer chain, or represents a different integer. 제1항에 있어서, 다음 일반식의 상호결합 구조단위를 90몰 퍼센트 함유하는 중합체를 형성시킴을 특징으로 하는 제조방법. The method of claim 1, wherein the production method characterized by Sikkim form a polymer, which then contains 90 per cent by mole of interconnected structural units of the formula. 상기 식에서 Ｂ는 일반식 Ｈ 2 Ｎ-Ｂ－ＮＨ 2 (여기서 Ｂ는 2-20개의 탄원소자를 갖는 지방족 또는 시클로 지방족시, 6-20개의 탄소원자를 갖는 헤테로고리기, 4-500개의 탄소원자를 갖는 폴리옥시알킬렌기, 6-40개의 탄소원자를 갖는 방향족기이다)를 갖는 디아민에서 유도된 2가지이거나, 또는 비스(아미노기능)폴리실옥산 이나 이의 조합물에서 유도되고 ; Wherein B is having from general formula H 2 N-B-NH 2 ( wherein B is a 2-20 plea of aliphatic or cycloaliphatic when having an element, a heterocyclic group having from 6 to 20 carbon atoms, and 4-500 carbon atoms a polyoxyalkylene group, an aromatic group having from 6-40 carbon atoms) or the two kinds derived from diamine having, or bis (amino functionality) is derived from polysiloxanes or combinations thereof; Ｓ는 ｌ이상의 정수이다. S is an integer equal to or greater than l.
제1항에 있어서, Ａ가 4가벤젠 또는 나프탈렌 핵이나 다음 일반식의 치환된 4가기임을 특징으로 하는 제조방법. The method of claim 1, wherein the production method characterized in that A is a tetravalent benzene or naphthalene nucleus or the general formula of the substituted 4 to the top. Ｘ 3 와 Ｘ 4 는 각각 -Ｏ-, -Ｃ-, -Ｓ-, -Ｓ-, -Ｓ-, -Ｃ-, -Ｏ- 또는 1-30개의 탄소원자를 갖는 선형 또는 분지형 알킬렌이나, 2-30개의 탄소원자를 갖는 알켄일렌이다. 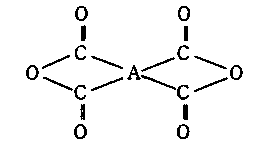 X 3 and X 4 is a linear or branched alkyl having each -O-, -C-, -S-, -S-, -S-, -C-, -O- or 1 to 30 carbon atoms or alkylene, an alkenylene having from 2 to 30 carbon atoms. 또는 1-30개의 탄소원자를 갖는 치환이나 비치환 분지형 또는 선행 알킬렌이고 ; Or substituted having from 1 to 30 carbon atoms or unsubstituted branched or prior alkylene; Ｇ'는 치환이나 비치환 페닐렌 또는 다음식의 기. G 'is a substituted or unsubstituted phenylene, or the food. (여기서 Ｅ와 ｍ은 상술한 바와 같다)임을 특징으로 하는 제조방법. Method characterized in that (wherein E and m are as described above). 제3항에 있어서, Ｂ가 다음 일반식의 비스(아미노)폴리실옥산의 잔기임을 특징으로 하는 제조방법. 4. 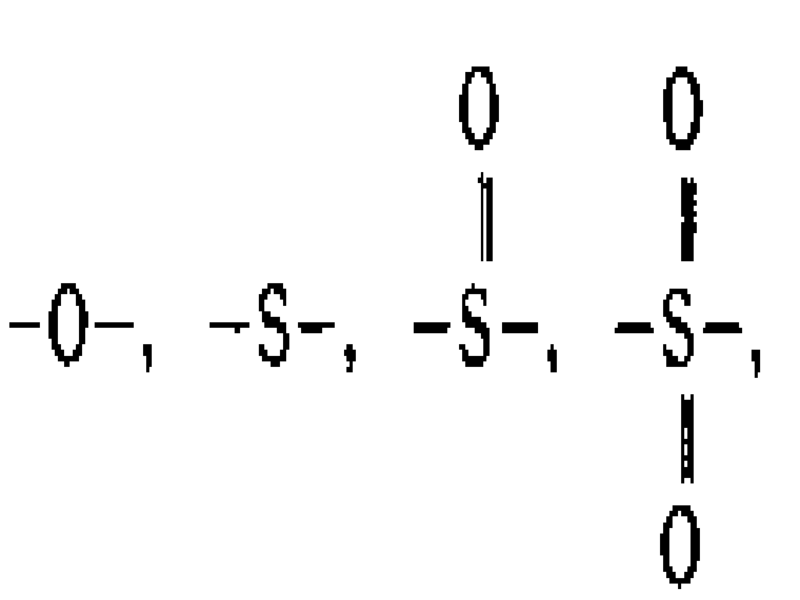 The method of claim 3, the manufacturing method characterized in that B has the following formula of bis (amino) polysiloxane of the residue. 이고 ; ego ; Ｄ는 치환 도는 비치환 하이드로카르빌렌이고 ; D is unsubstituted dihydro-hydrocarbylene, and substituted turn; Ｒ 6 ,Ｒ 7 ,Ｒ 8 ,Ｒ 9 ,Ｒ 10 과 Ｒ 11 은 각각 치환 또는 비치환 하이드로카르빌이고 ; R 6, R 7, R 8 , R 9, R 10 and R 11 are each a substituted or unsubstituted hydrocarbyl, and; ｈ,ｉ와 ｊ는 각각 0-100의 값을 갖는다. h, i and j has a value of 0 to 100, respectively. 제1항에 있어서, Ｘ 1 과 Ｘ 2 가 각각 다음식의 2가기입을 특징으로 한는 제조방법. The method of claim 1 wherein, X 1 and X 2 each are 2 top wear an an aspect of the method of manufacturing the food. 상기 식에서 Ｒ 4 와 Ｒ 5 는 각각 수소, 1-12개의 탄소원자를 갖는 치환 또는 비치환 알킬, 2-12개의 탄소원자를 갖는 치환 또는 비치환 알켄일, 4-12개의 탄소원자를 갖는 치환 또는 비치환 시클로알킬, 5-24개의 탄소원자를 갖는 치환이나 비치환 탄소고리 방향족 또는 헤테로고리 방향족기 나타내며, 그러나 Ｒ 4 와 R 5 는 둘다 수소를 나타내지 않을 때이다. Wherein R 4 and R 5 are each hydrogen, 1-12 carbon atoms having from substituted or unsubstituted alkyl, substituted or unsubstituted alkenyl having from 2 to 12 carbon atoms, cycloalkyl substituted or unsubstituted having from 4-12 carbon atoms alkyl, having from 5-24 carbon atoms indicates a substituted or unsubstituted carbocyclic aromatic or heterocyclic aromatic group, but R 4 and R 5 is when both represent hydrogen. 제7항에 있어서, Ｒ 4 와 Ｒ 5 는 각각 Ｃ 1-8 알킬, Ｃ 2-8 알켄일, 또는 Ｃ 4-8 시클로알킬임을특징으로 하는 제조방법. The method of claim 7, wherein the production method characterized in that R 4 and R 5 are each C 1-8 alkyl, C 2-8 alkenyl, or C 4-8 cycloalkyl. 제1항에 있어서, 이 무수물(ｂ)을 방향족 디아민(ｂ)과 하나 또는 그 이상의 다른 디아민과 반응시키고, 방향족 디아민(ｂ)이 사용된 디아민의 10몰%로 이루어짐을 특징으로 하는 제조방법. 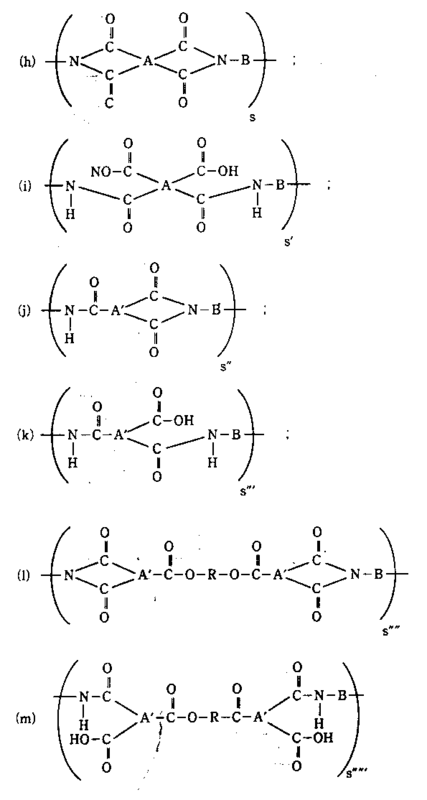 According to claim 1, wherein the anhydride (b) an aromatic diamine (b) and one or and further reaction with other diamines, the manufacturing method characterized in that the aromatic diamine (b) made of an 10 mol% of the diamine used. (ⅳ) 물을 완전히 제거한후, 얻은 생성용액을 냉각시키고 원하는 중합체를 회수함을 특징으로 하는 제조방법. (Ⅳ) after completely removing the water, the manufacturing method characterized by Cool the resulting solution obtained recovering the desired polymer. DE3689881T2 (en) * 1986-06-30 1995-01-05 Mitsui Toatsu Chemicals With copper-clad flexible printed circuit board. DE3888666D1 (en) * 1988-01-08 1994-04-28 Nissan Chemical Ind Ltd Polyimide resin and insulation layer for electrical or electronic devices. 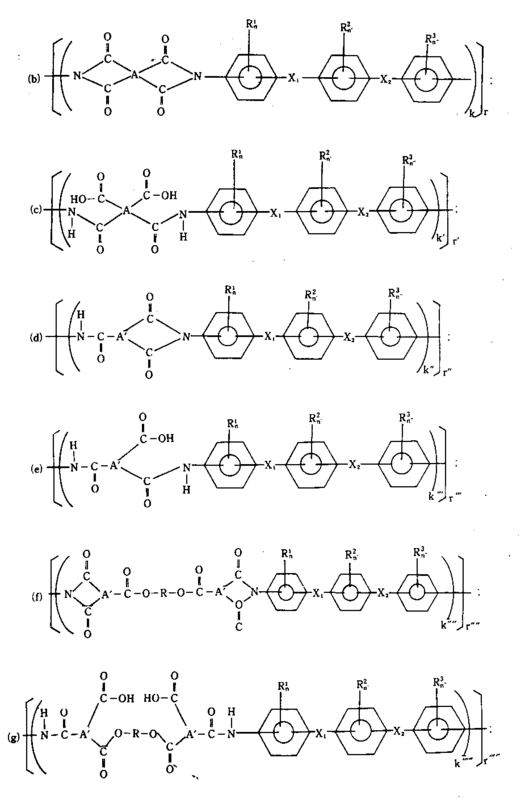 NL188224C (en) * 1980-01-10 1992-05-06 Gen Electric Copolymers of ether imides and amide-imides.